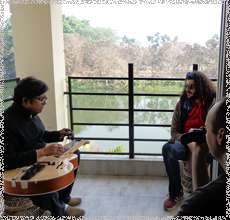 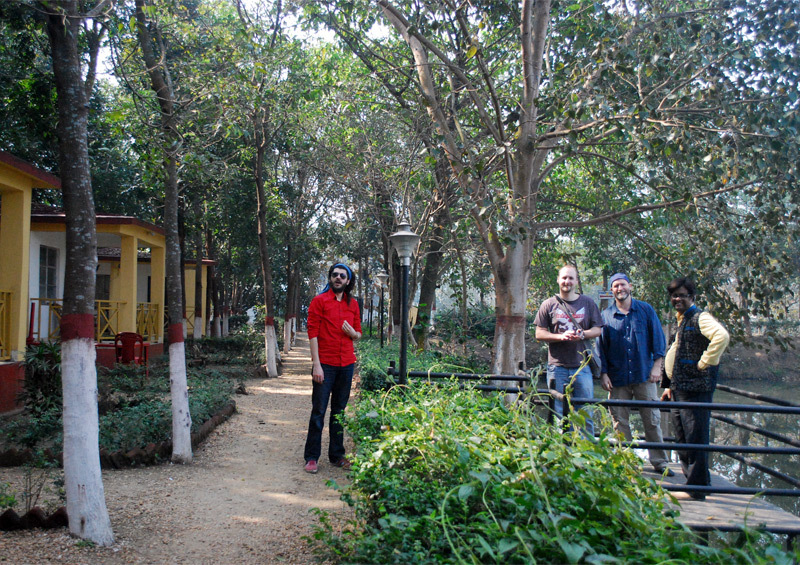 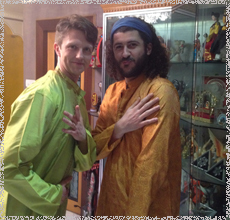 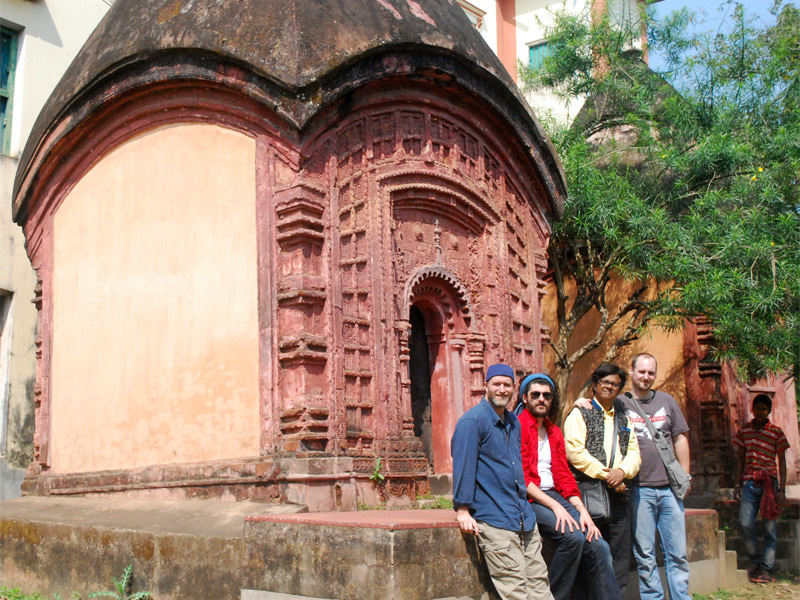 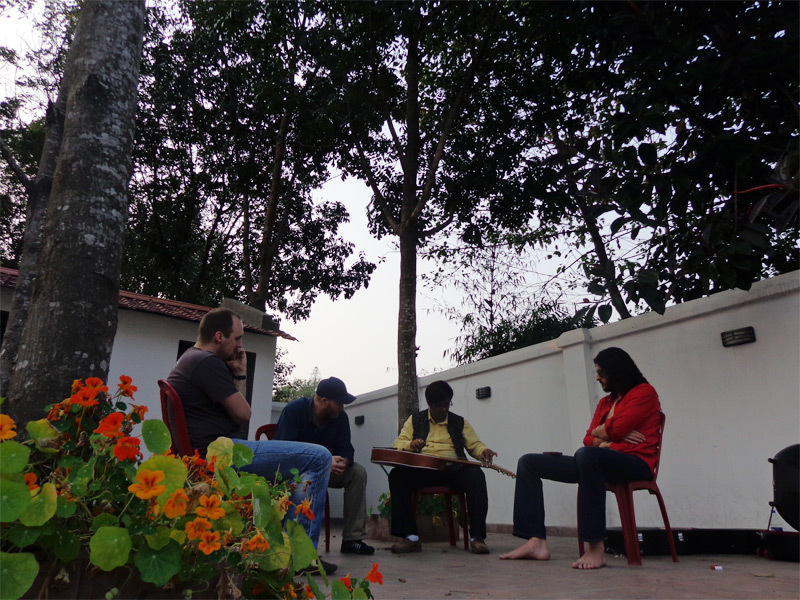 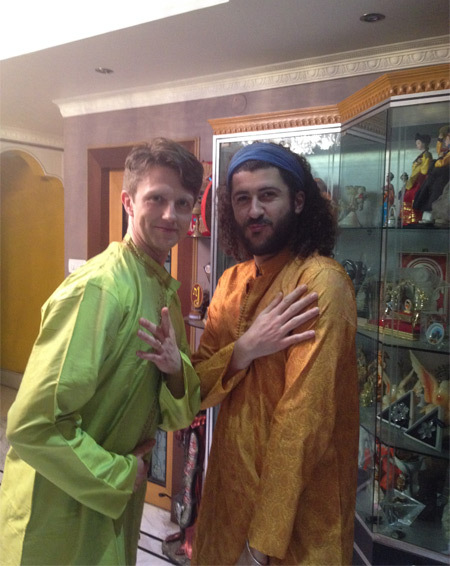 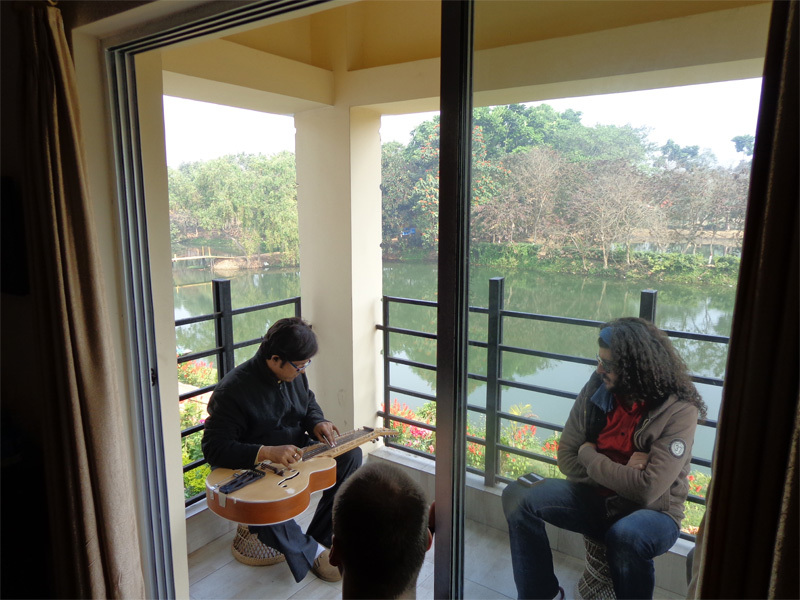 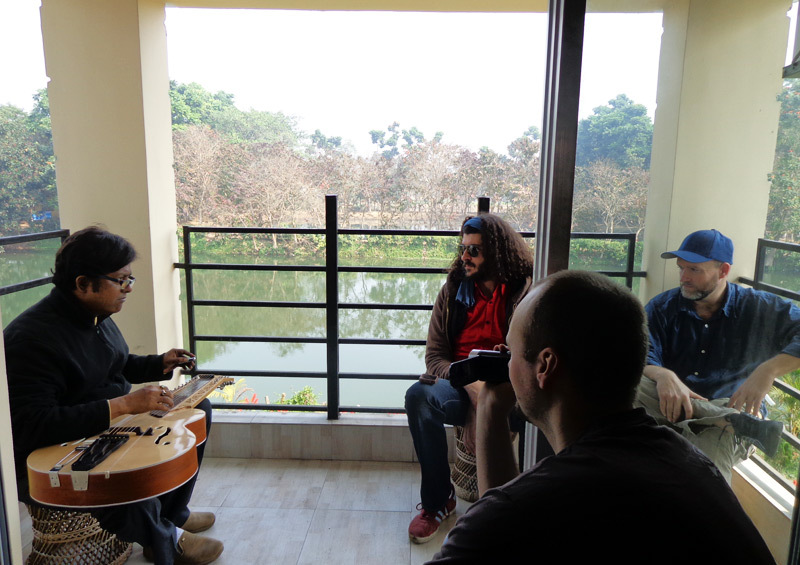 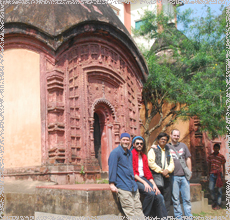 Eric with the school’s creative director Sudipta Biswas discussing theory. 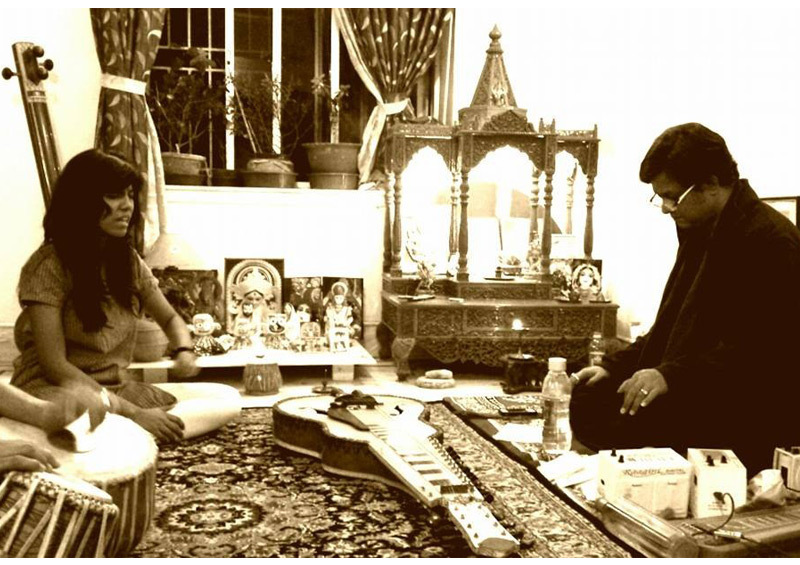 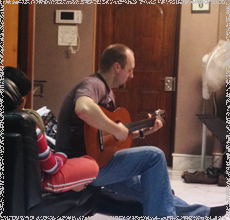 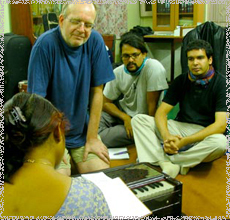 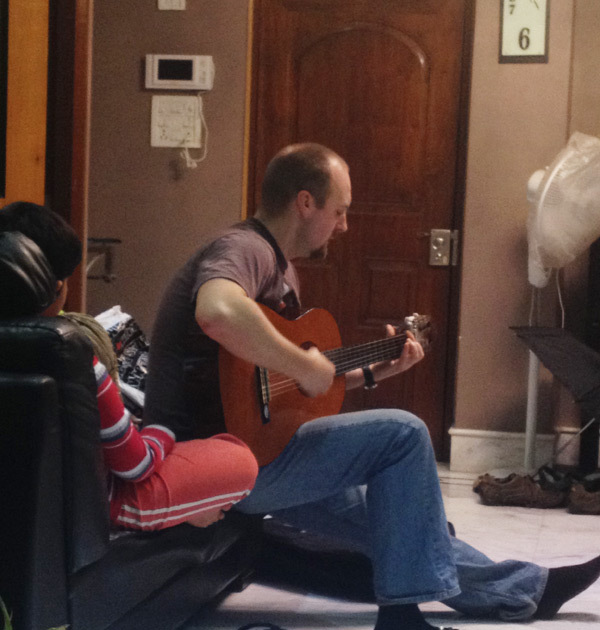 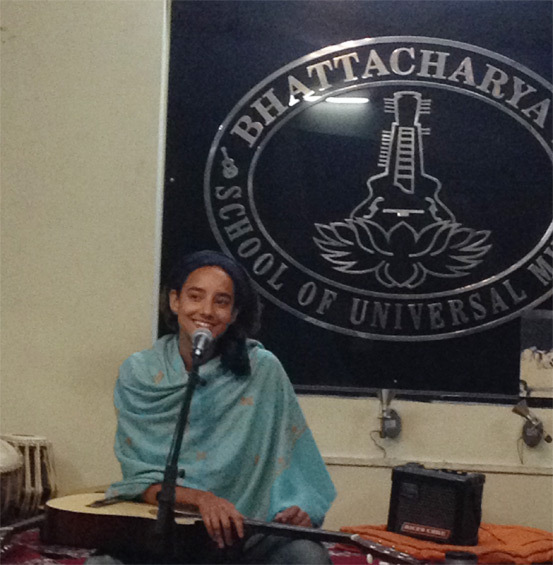 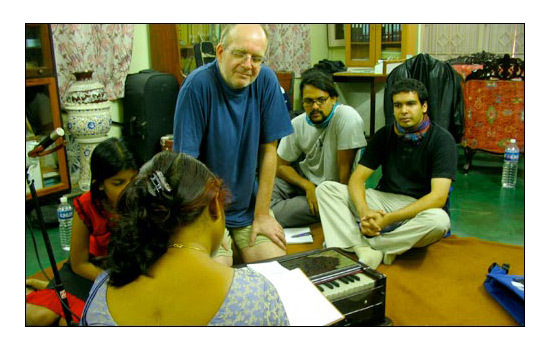 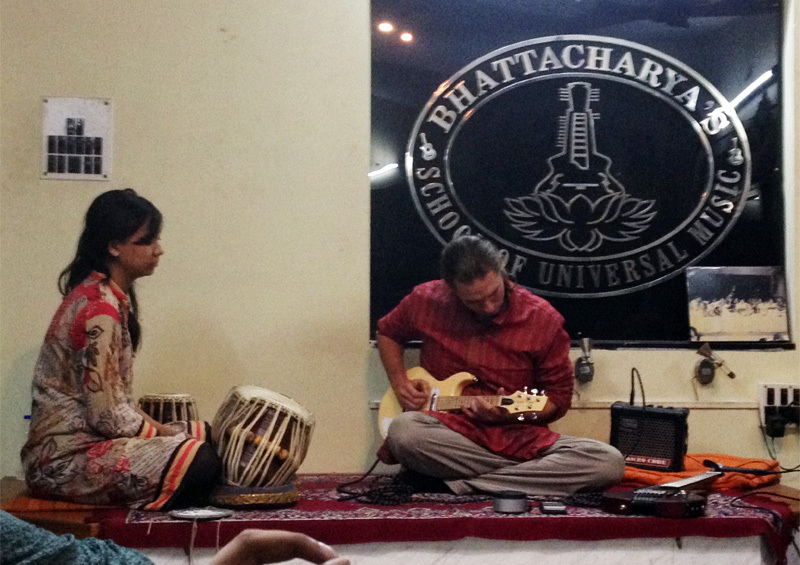 Vocal lessons with Sutapa Bhattacharya in BSUM workshop. 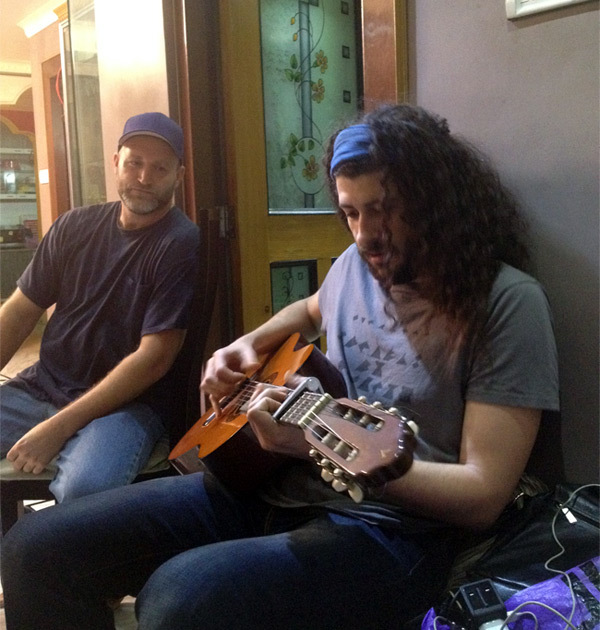 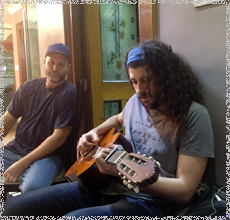 Olivier from France in the evening jam session. 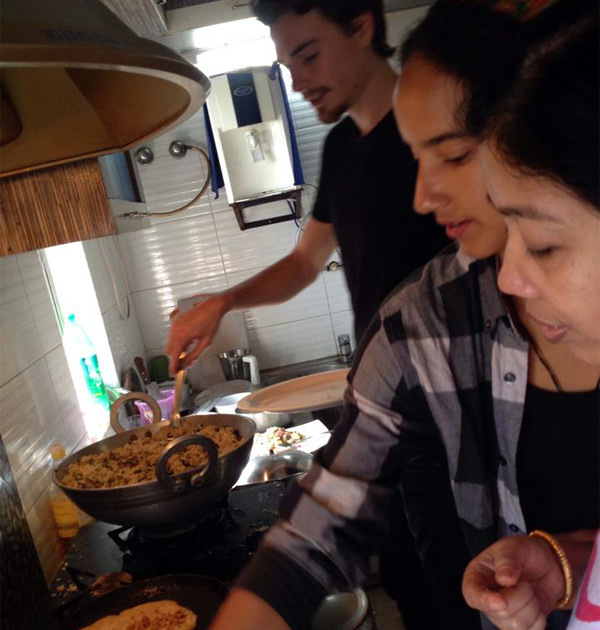 Food festival –students learning how to cook healthy Indian food. 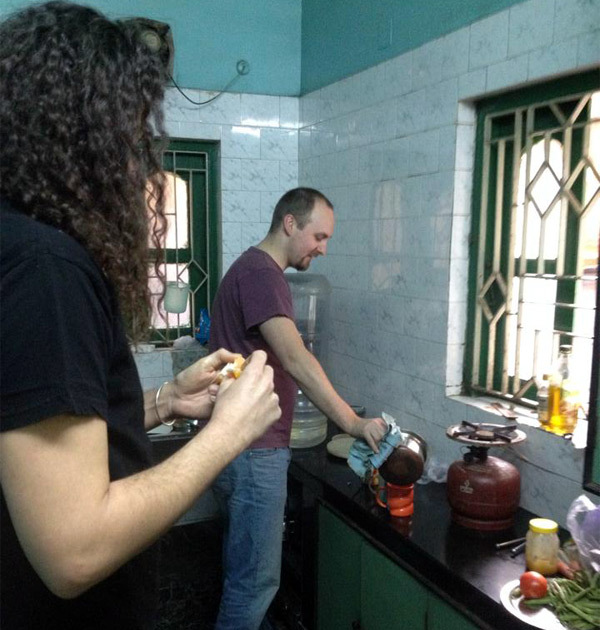 Students making own tea at the kicthen in the morning. 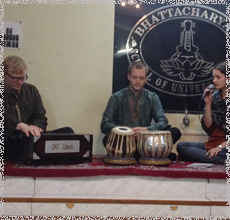 At the Dinner students often chat of music from all day. 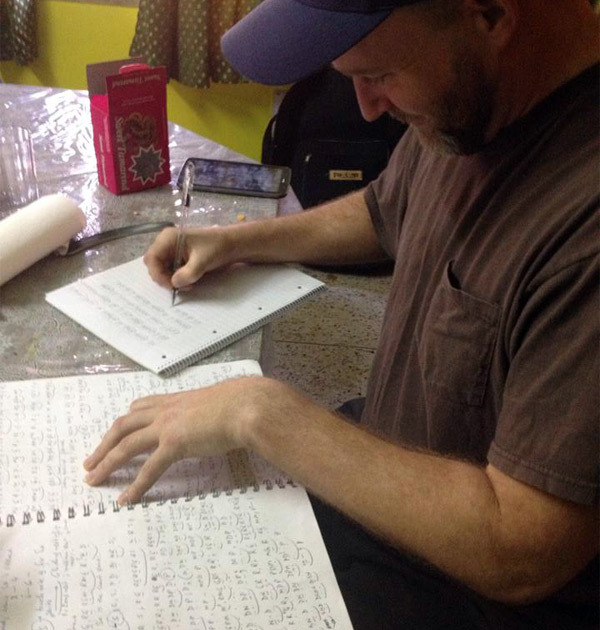 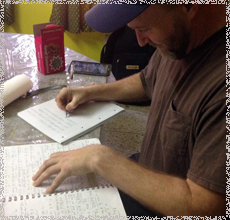 Bobby from USA is copying the notations. 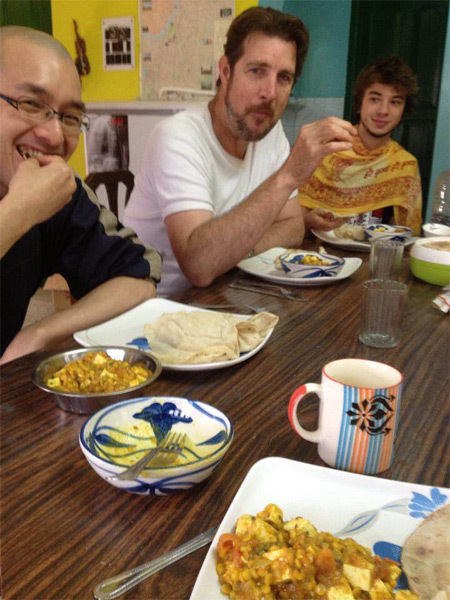 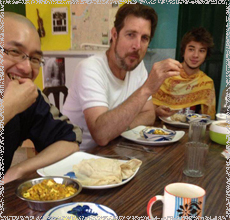 Shoichiro Japan, Nick Jason from Australia enjoying Japanese food cooked by Shoichiro. 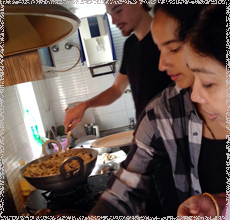 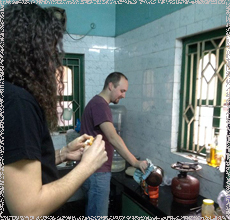 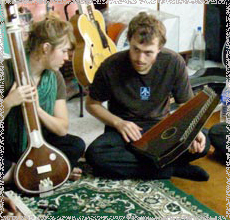 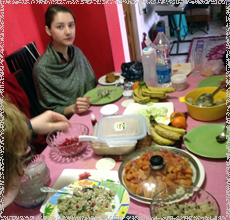 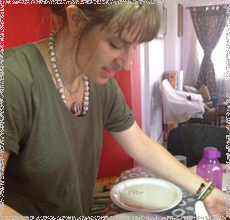 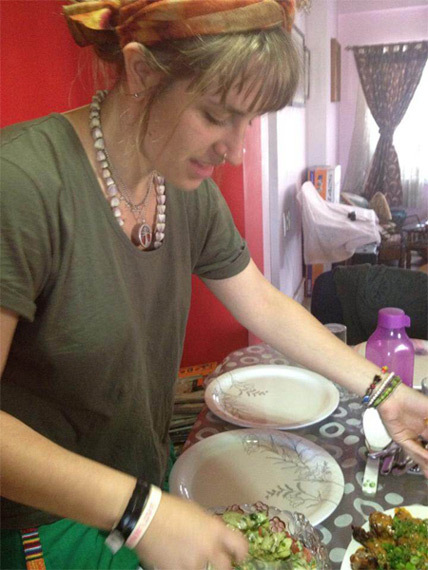 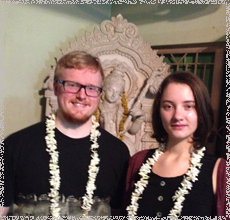 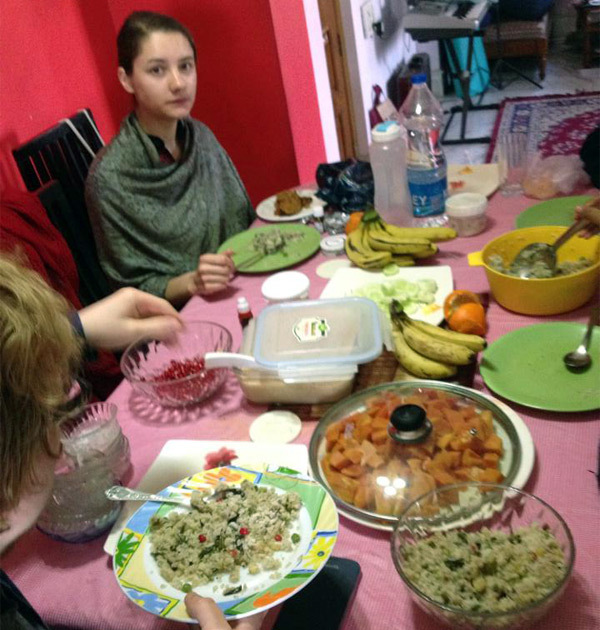 Eva from Australia, is preparing special Bengali dish she learned from Guruma. 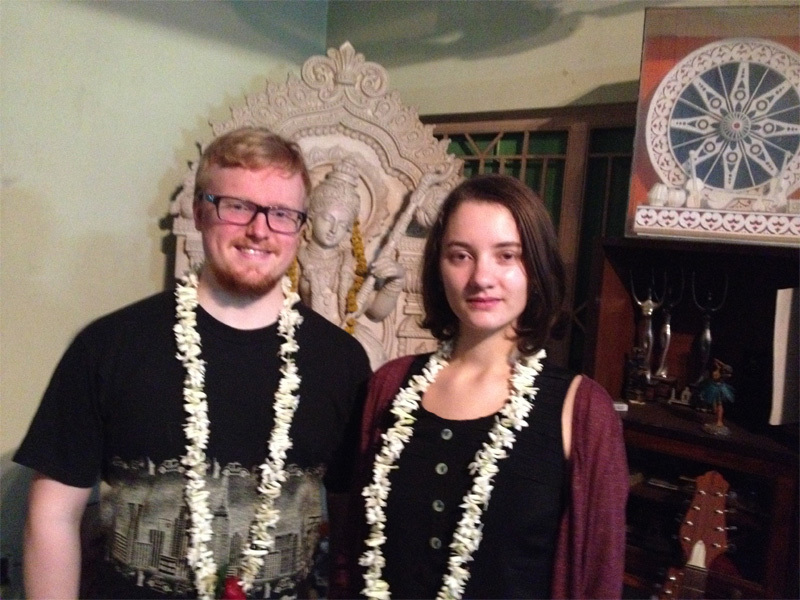 Norway couple Kjetil and Karolina after residency before departure from School. 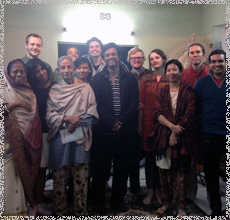 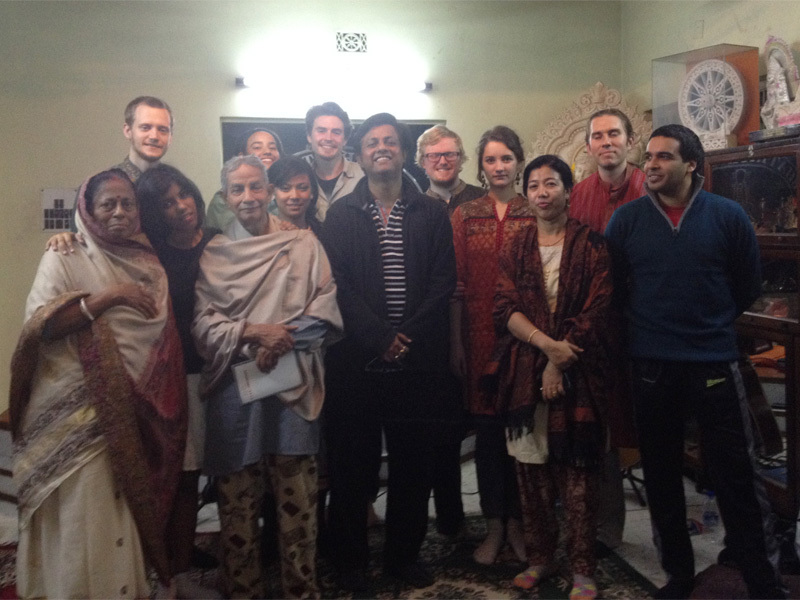 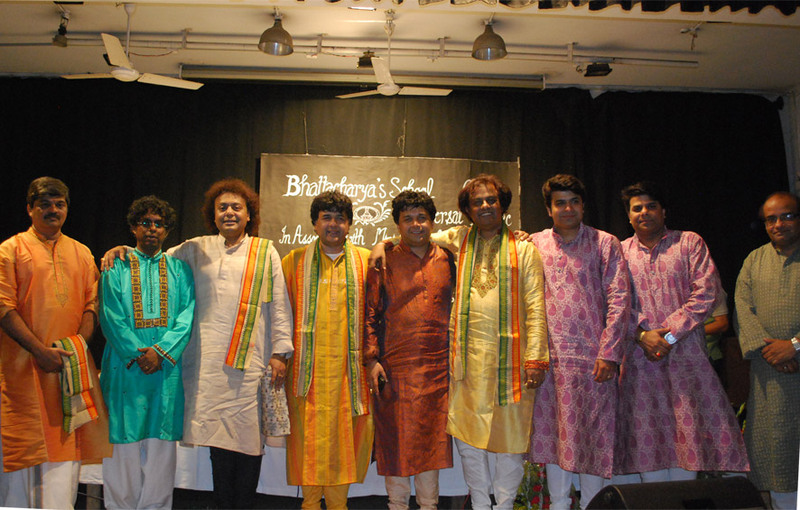 Gurus and Grand Gurus with students after concert at the school. 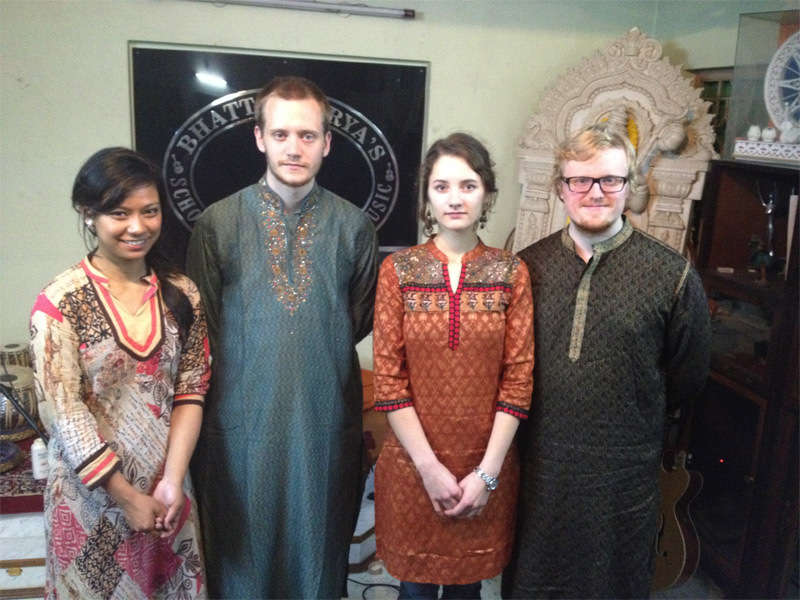 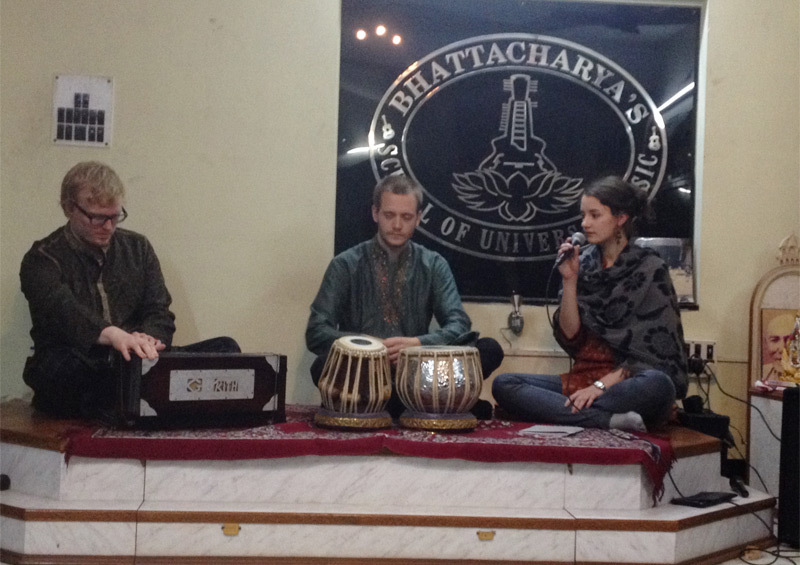 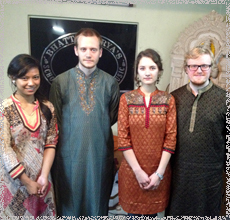 Norway group Andreas, Sanskriti, Kjetil and Karolina performed their quartet. 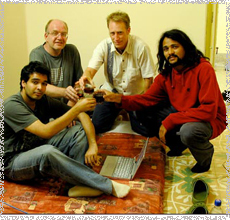 Old photo of Nishad Pandey, while other students are celebrating his birthday. 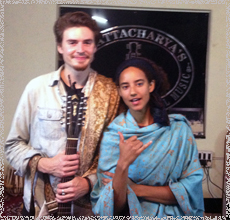 Beautiful singers from Hawaii Alex Kelly. 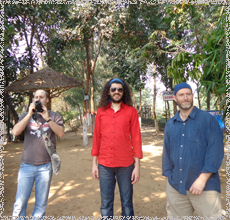 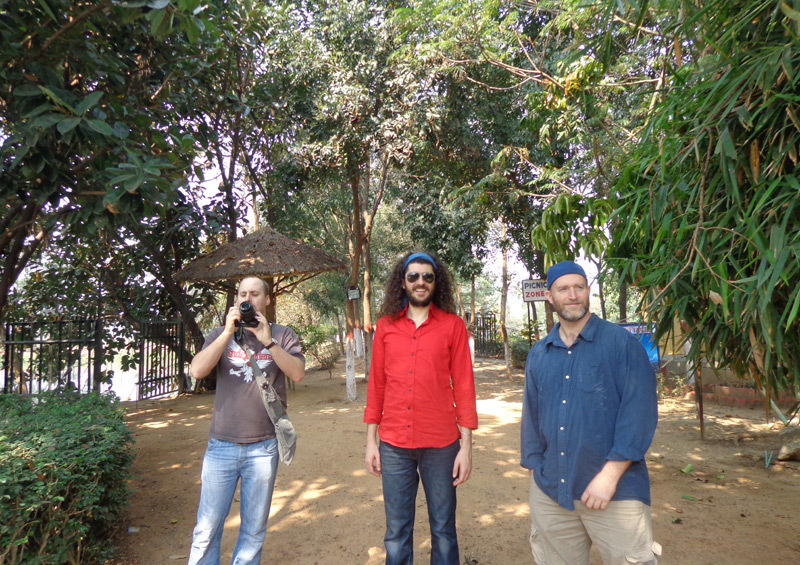 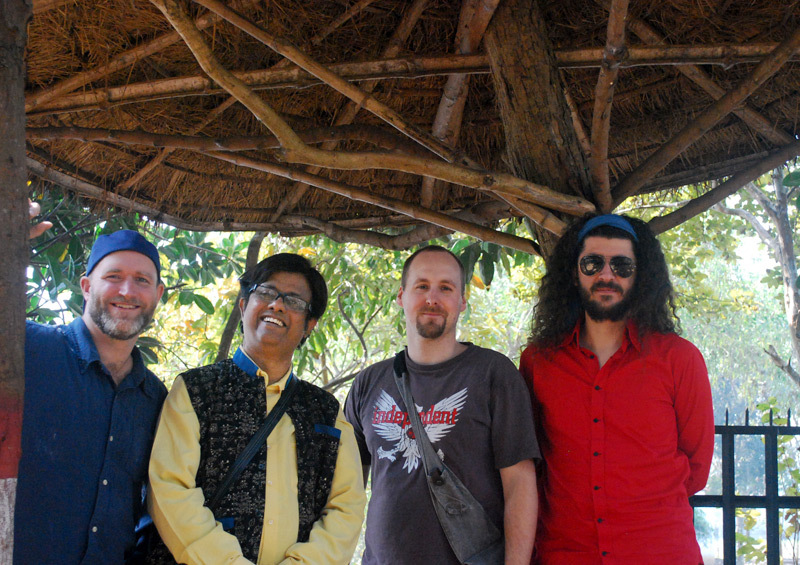 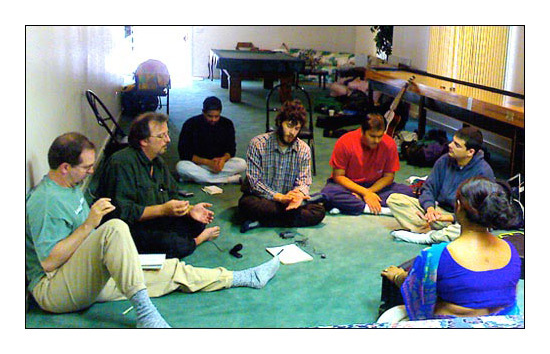 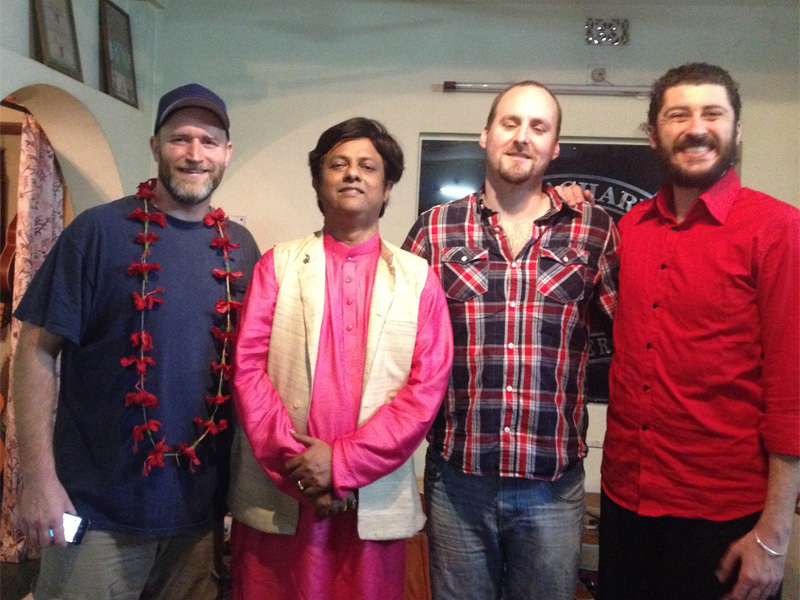 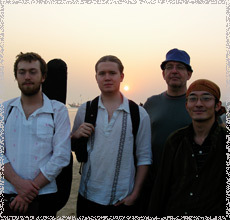 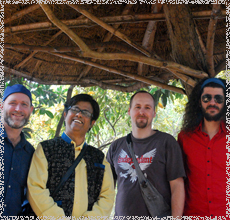 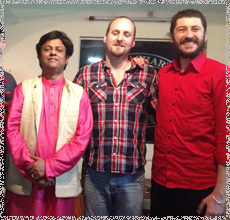 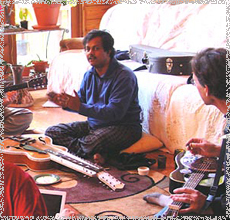 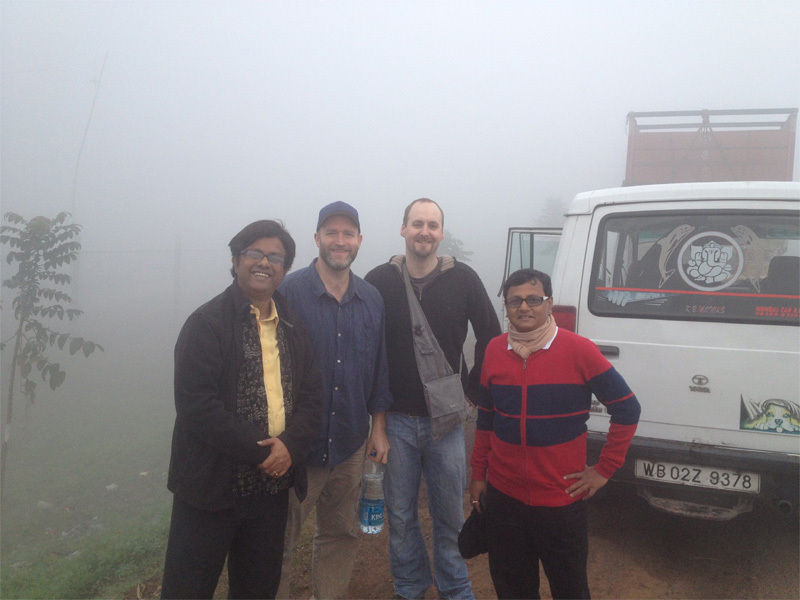 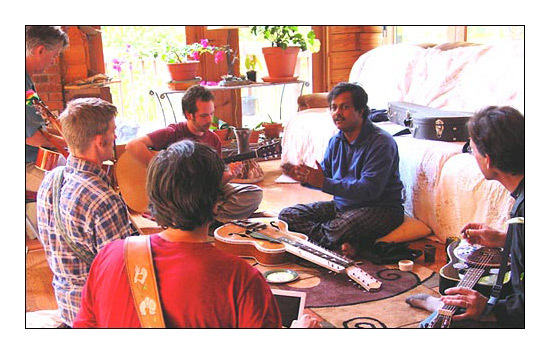 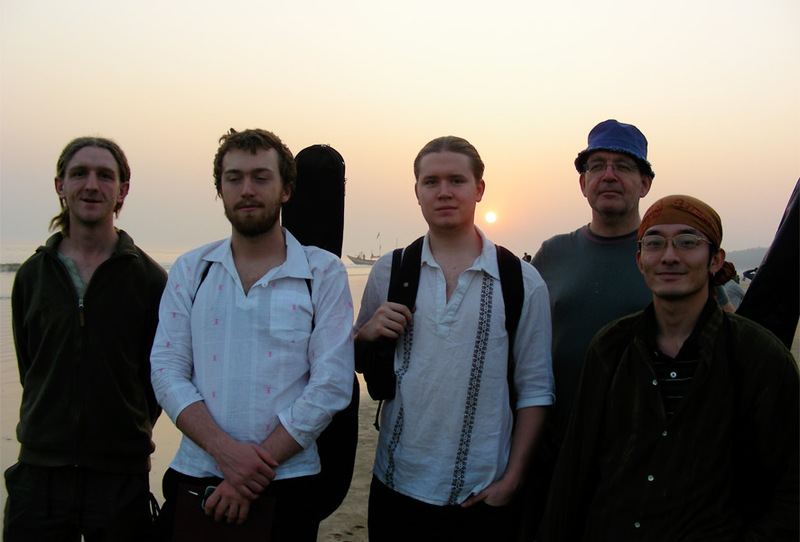 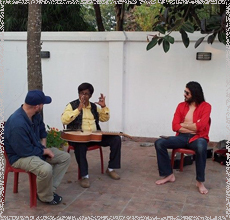 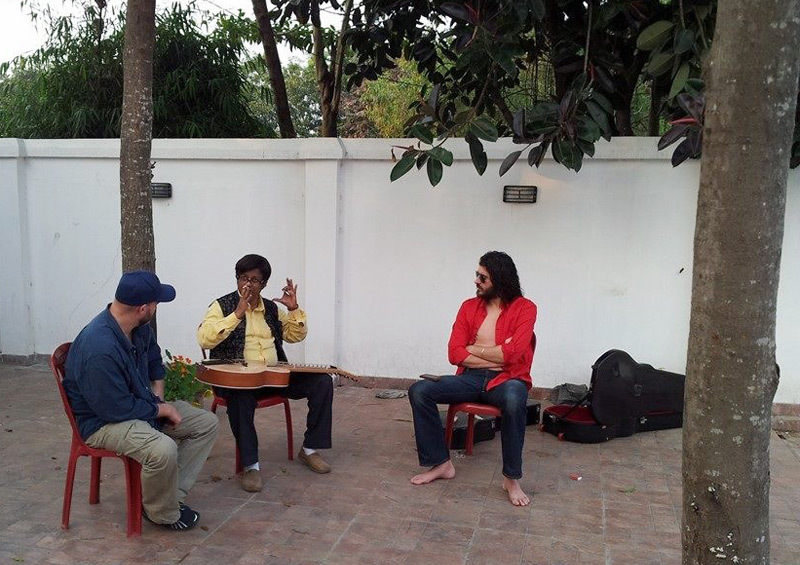 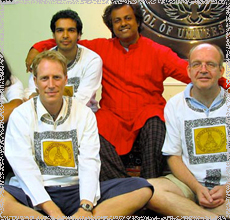 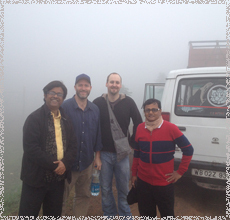 Ted Tanner from Canada, Nishad Pandey from Australia and Wolf from Norway with Guruji. 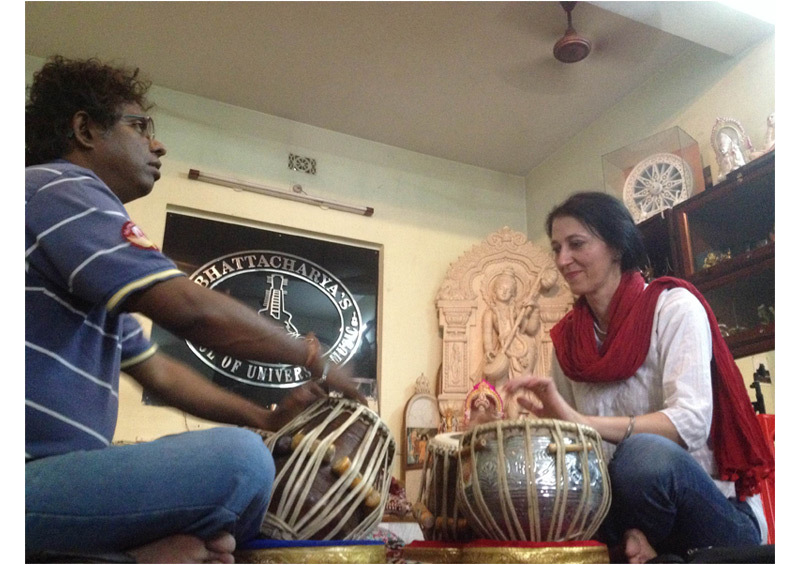 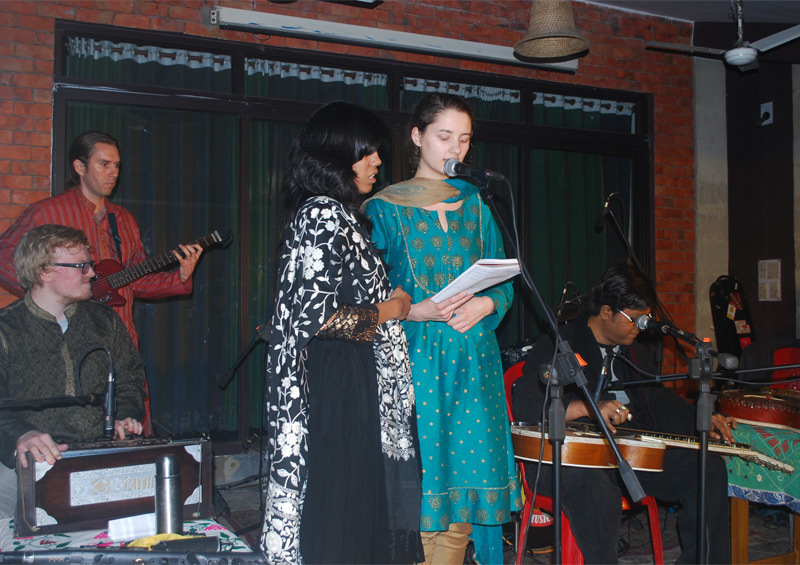 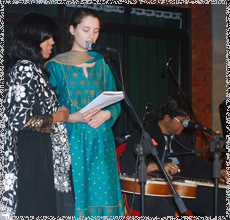 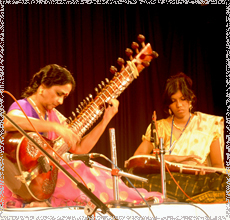 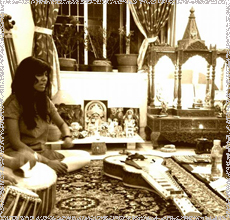 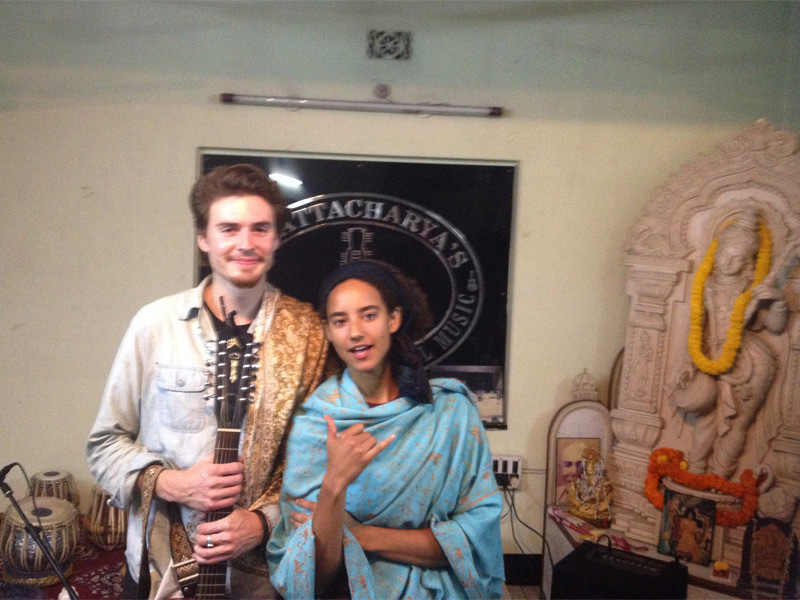 Karolin singing with Anandi Bhattacharya. 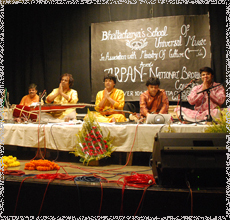 School students are performing in a subarb city concert. 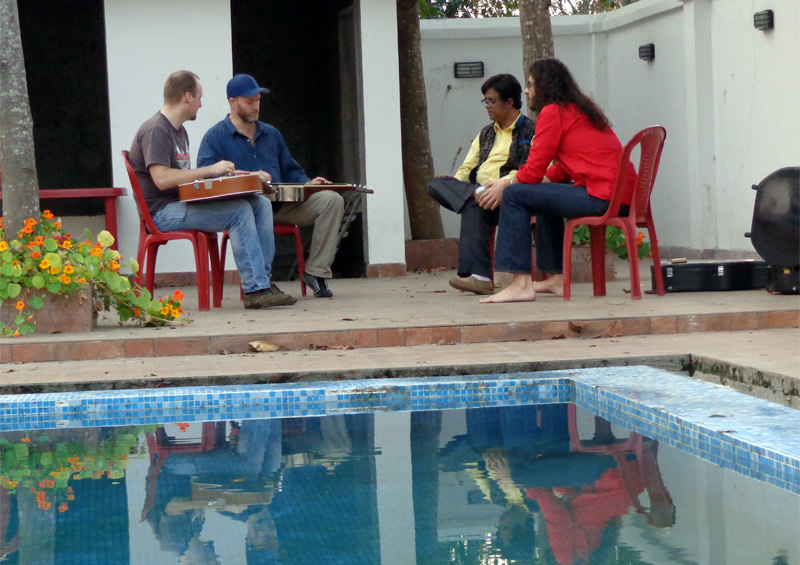 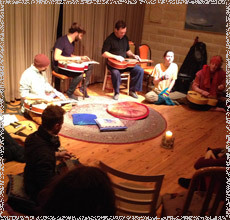 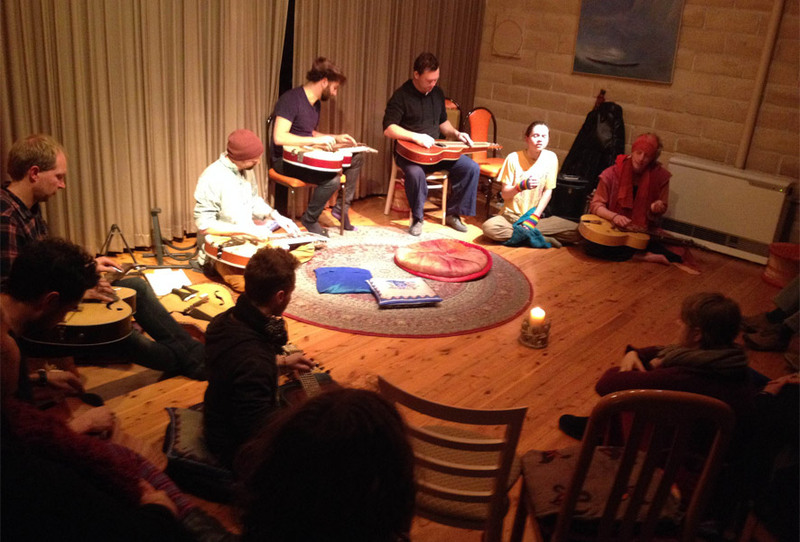 Anreas is playing tabla with Karolin and Kjetil. 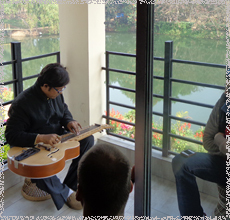 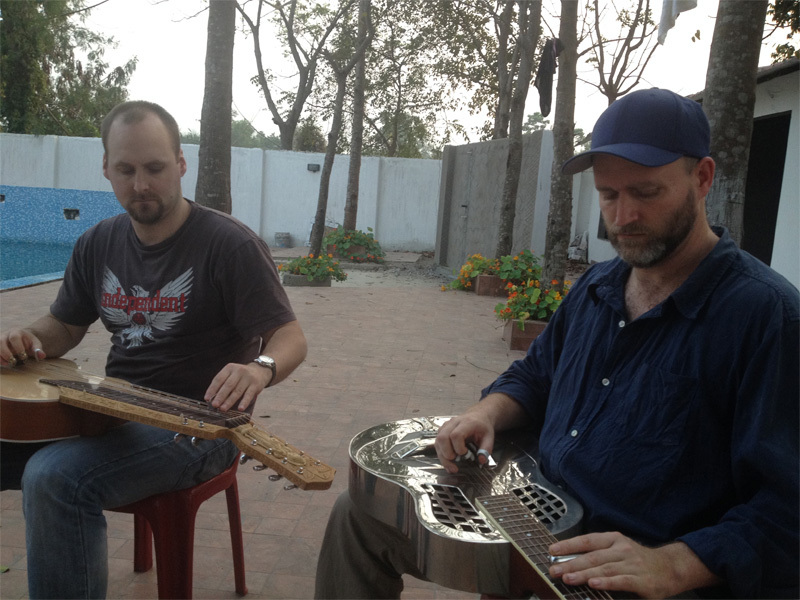 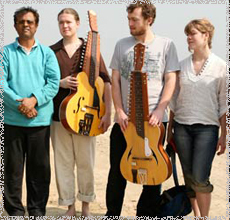 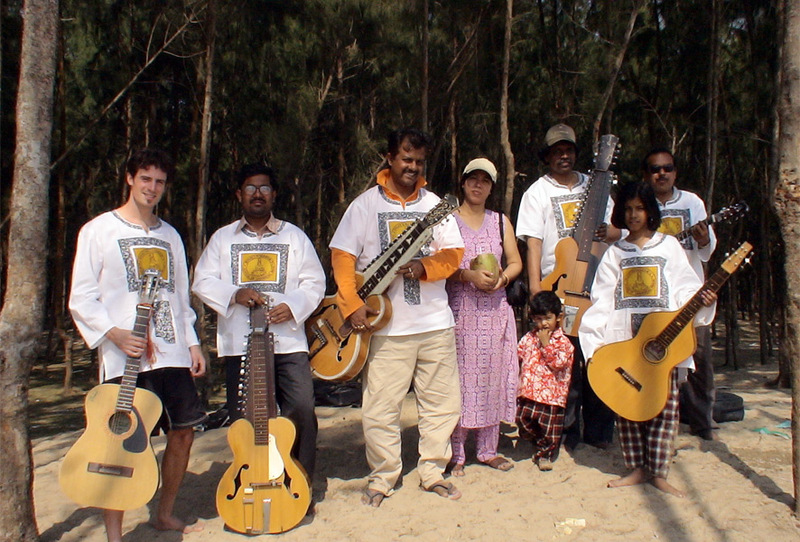 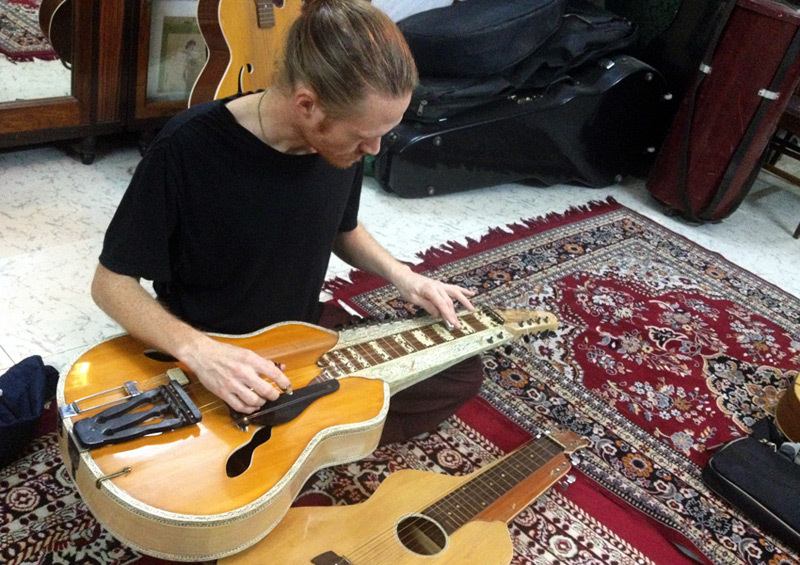 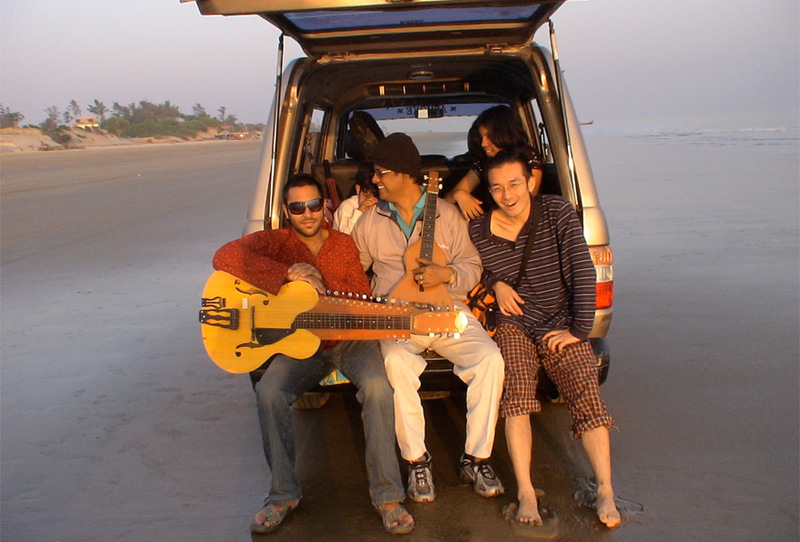 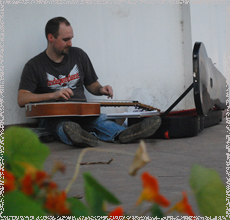 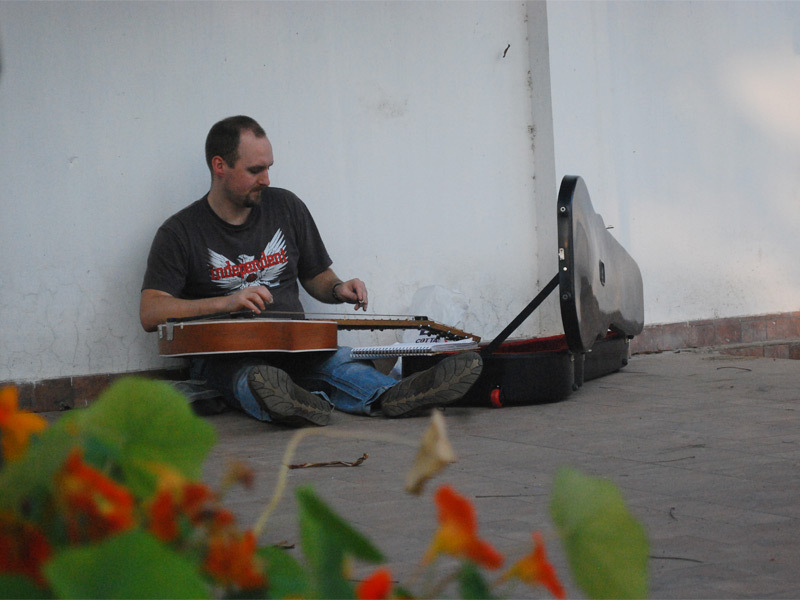 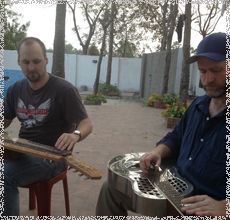 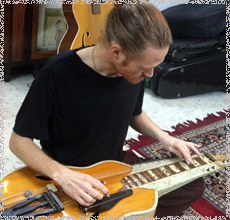 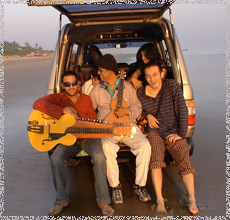 Shyamal Roy on slide guitar. 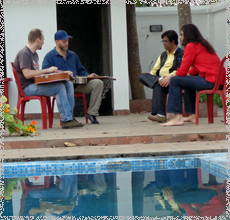 Krista from Hawaii is singing a blues song. 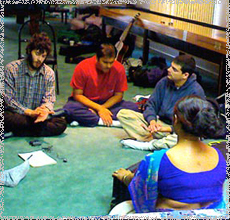 Many of the todays Training od f Indian Raga Music and performers as well doesn’t believe in the time scale theory of Raga, Guruji and is ancestors believed. 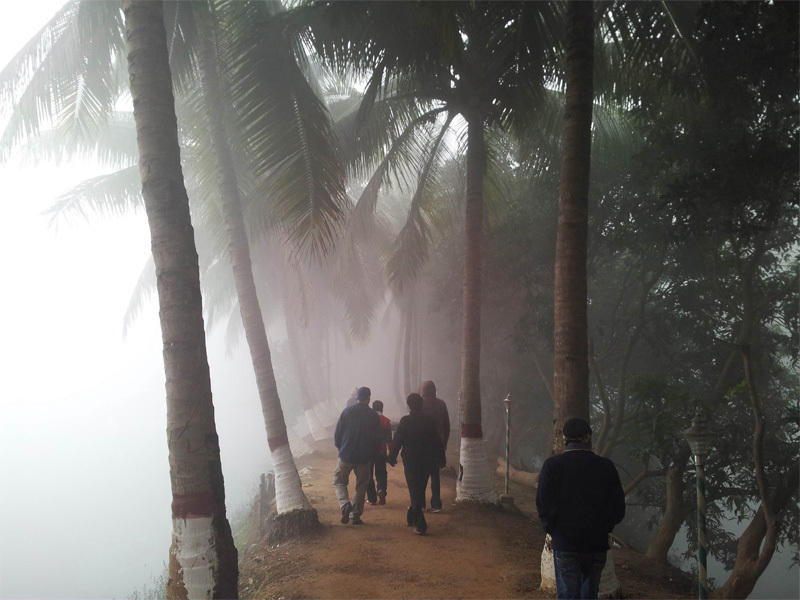 Excursion is a new event added to our school,…this is one part of the semester… specially created on request by those who want to understand by being with in it. 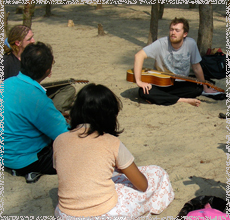 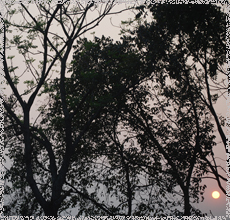 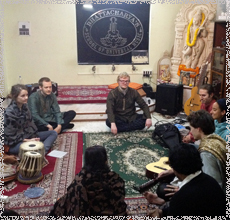 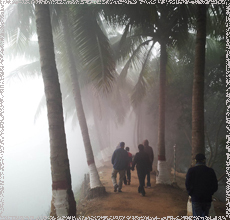 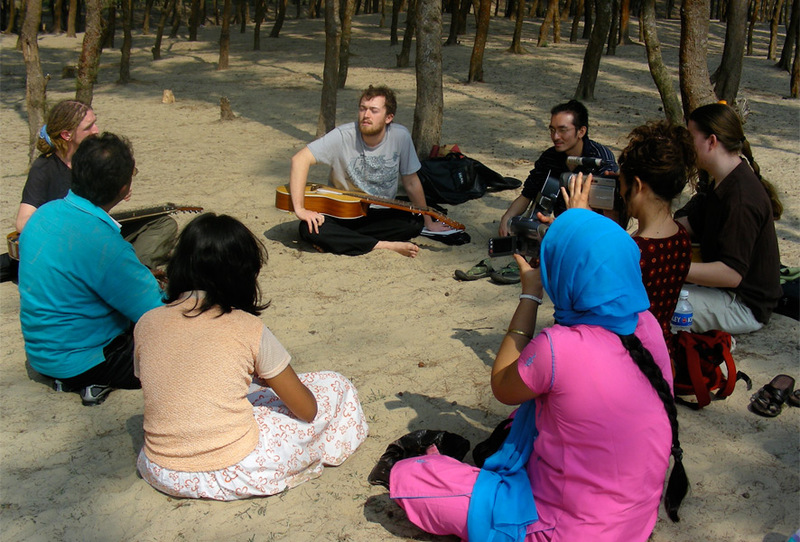 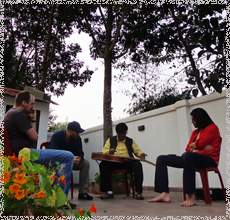 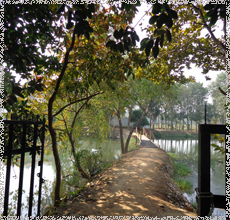 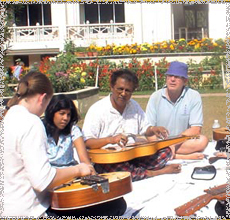 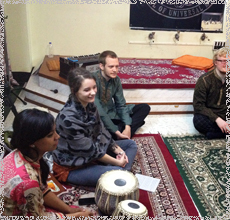 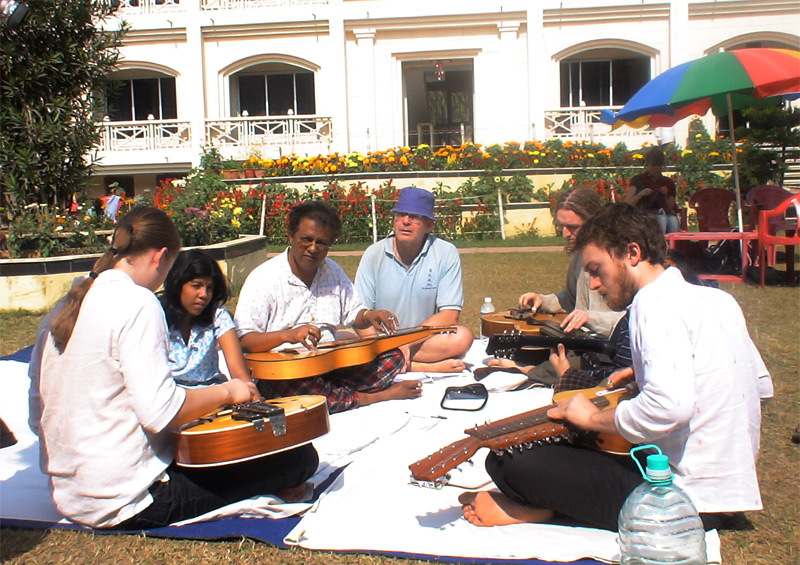 … Indian Raga music is not created in urban environment, how nature and Raga lives in each other, under Guruji’s gentle guidance students get to feel it.. is the new addition of the old Vedic system by Guruji, students get to stay with real pilgrimage with Gururji for one to few nights.. 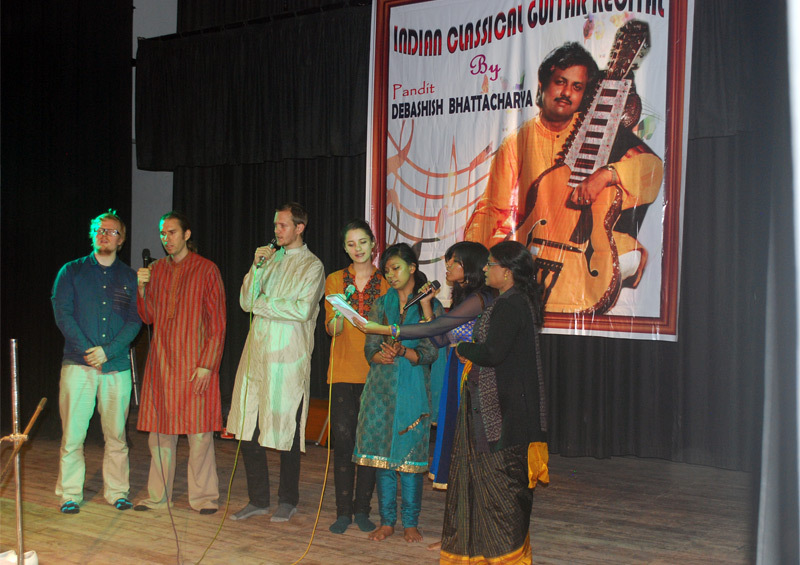 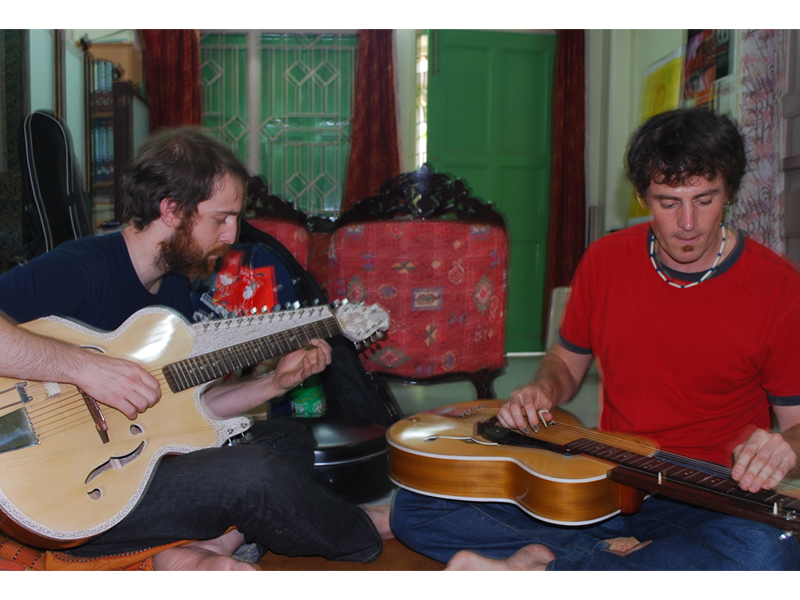 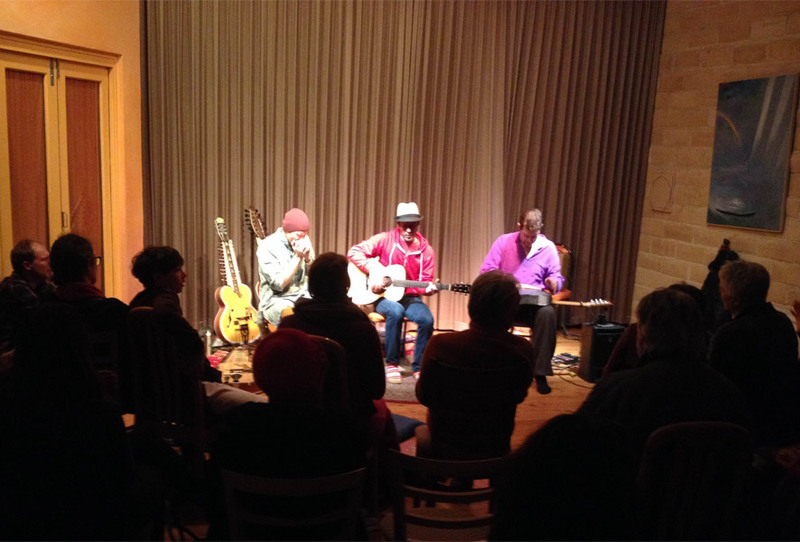 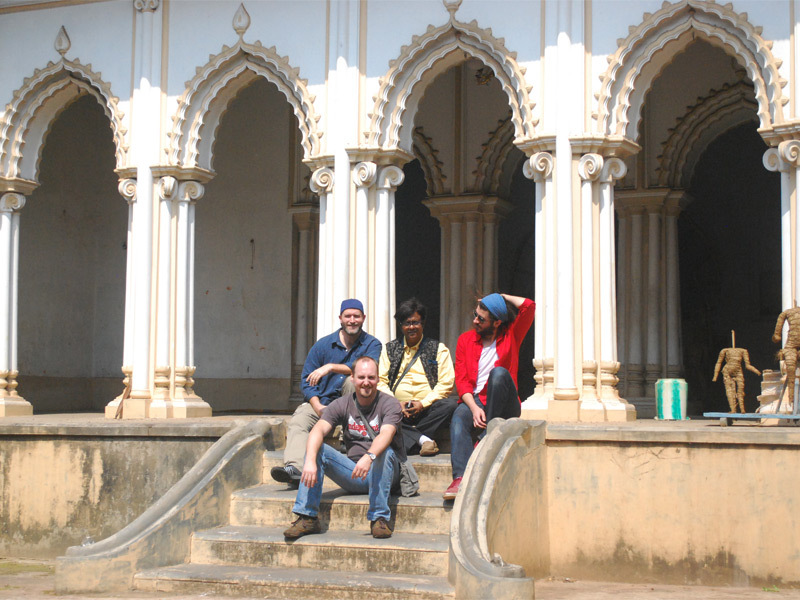 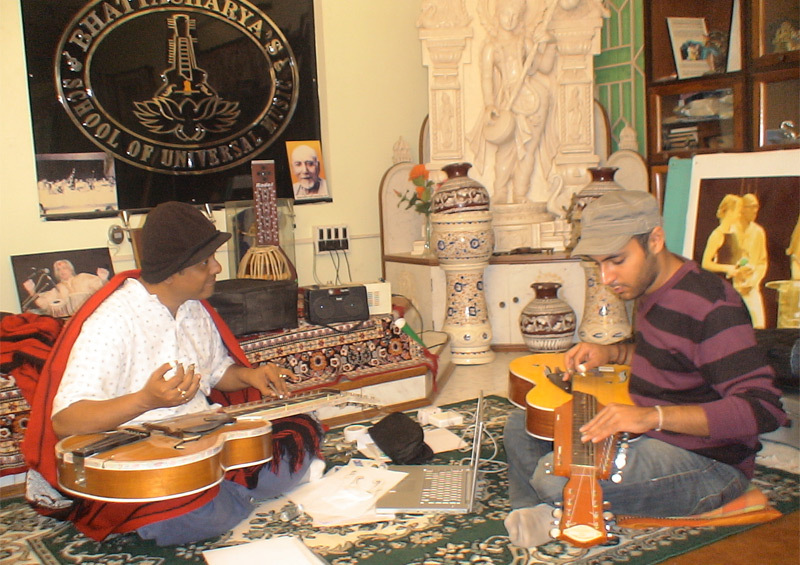 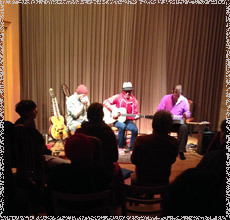 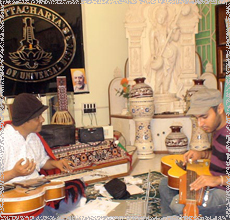 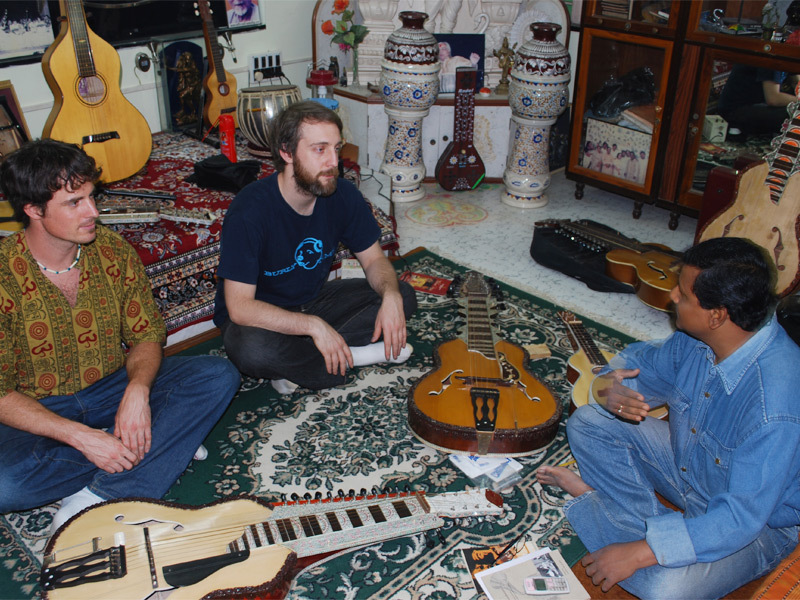 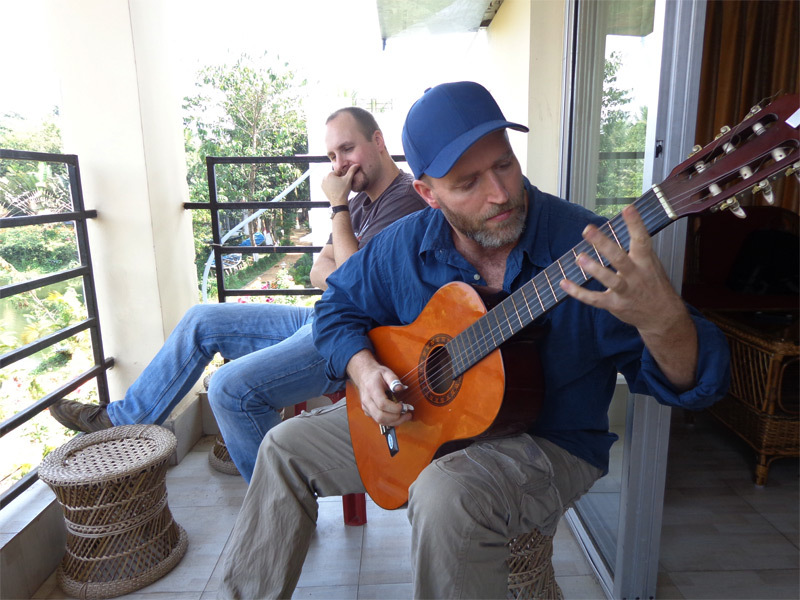 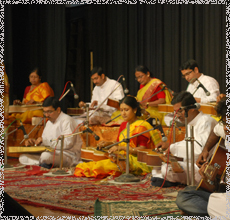 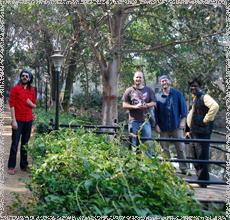 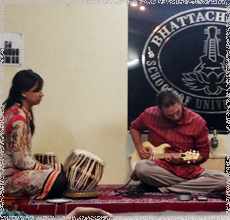 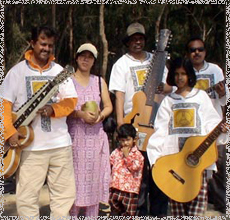 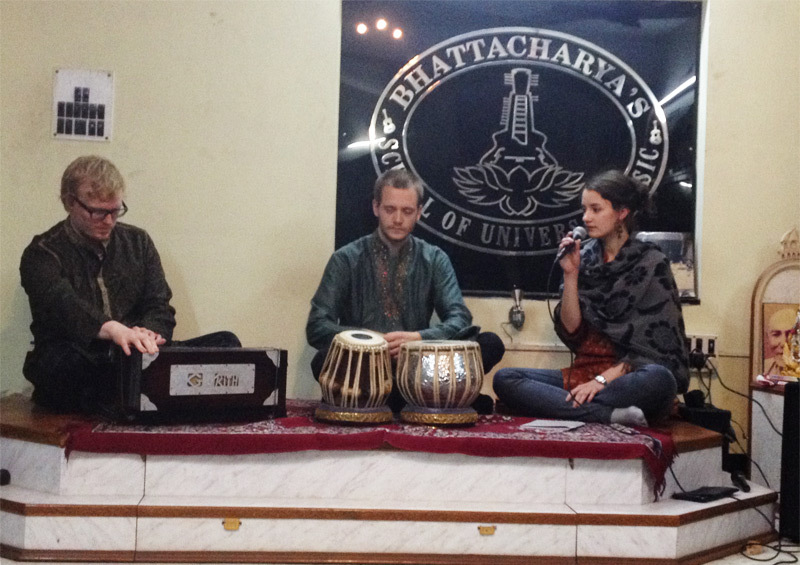 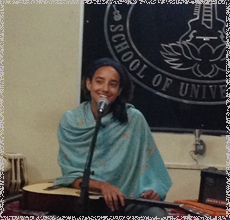 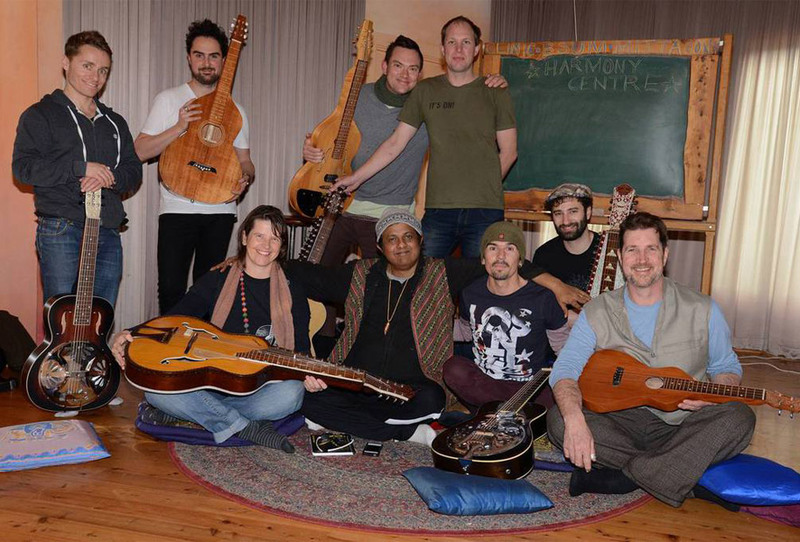 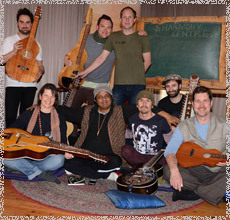 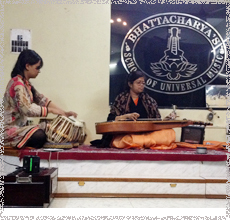 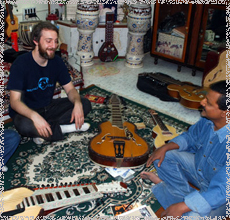 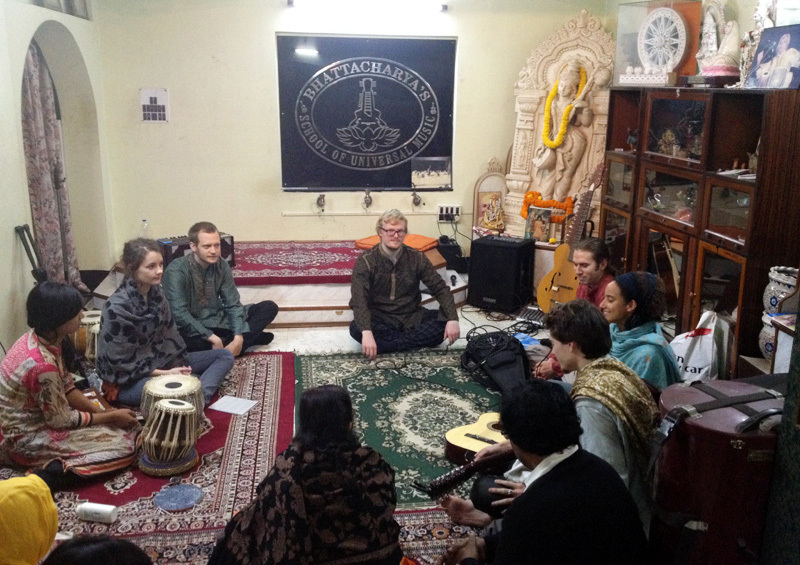 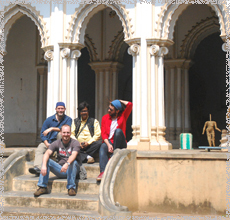 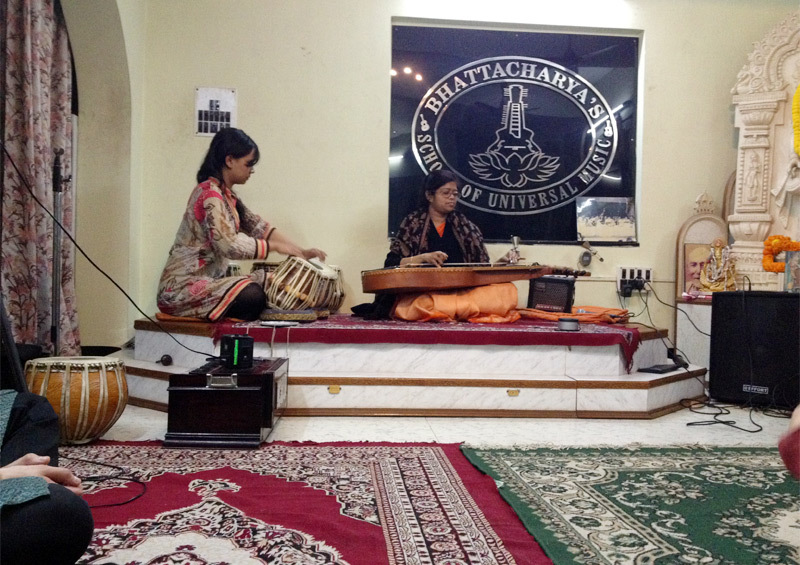 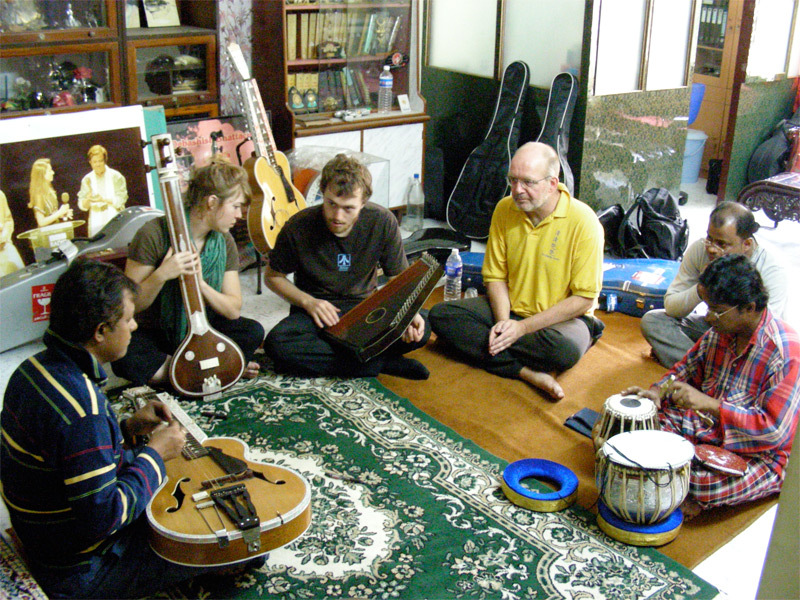 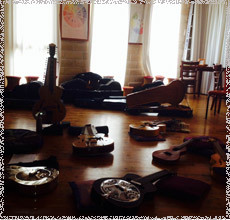 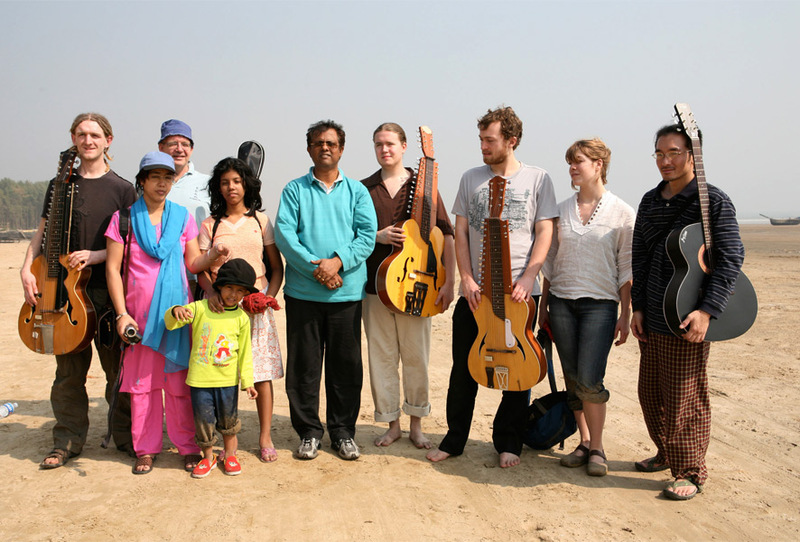 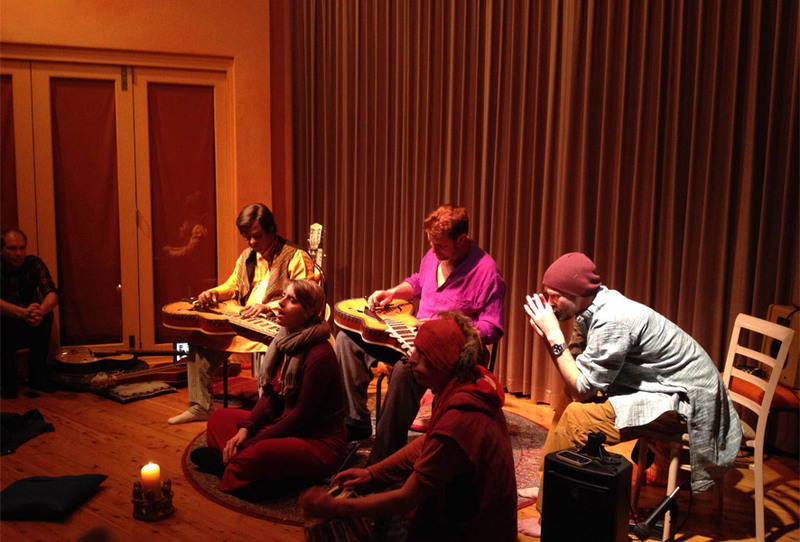 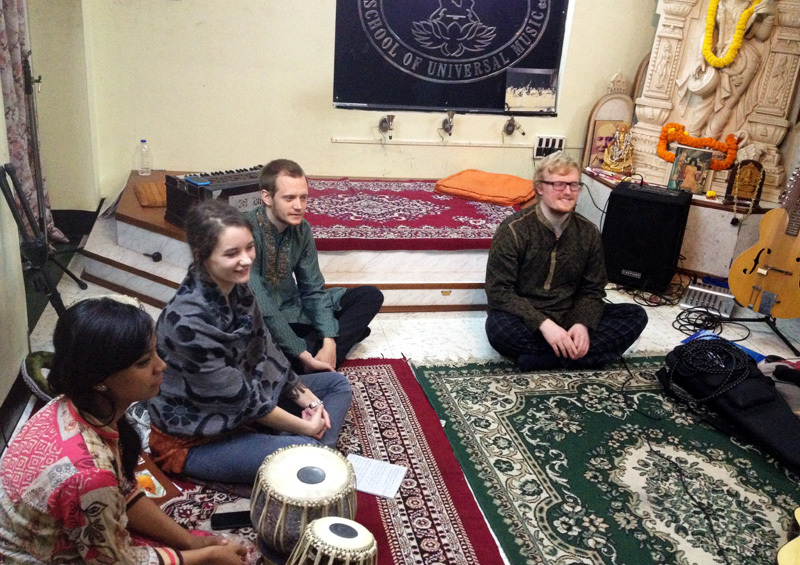 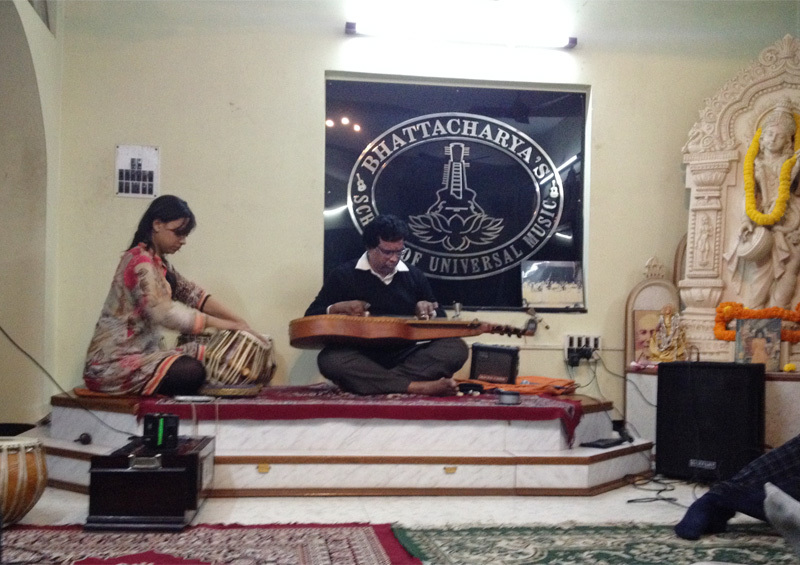 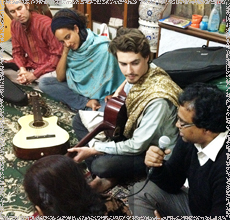 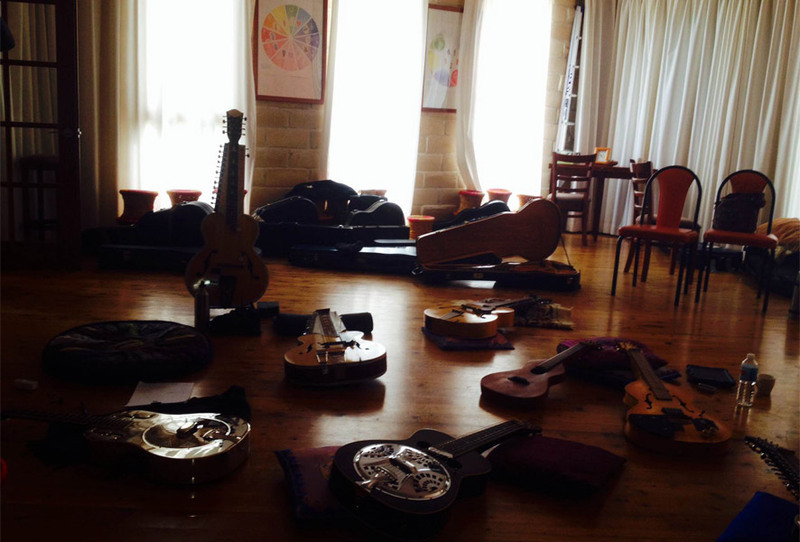 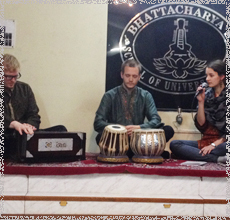 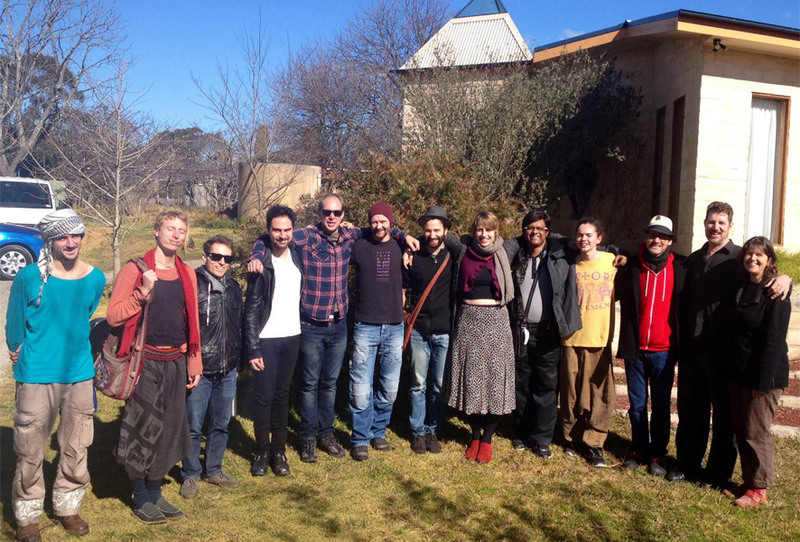 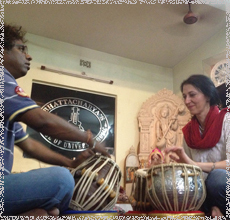 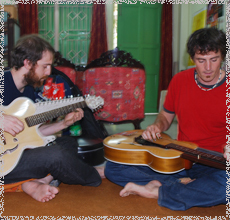 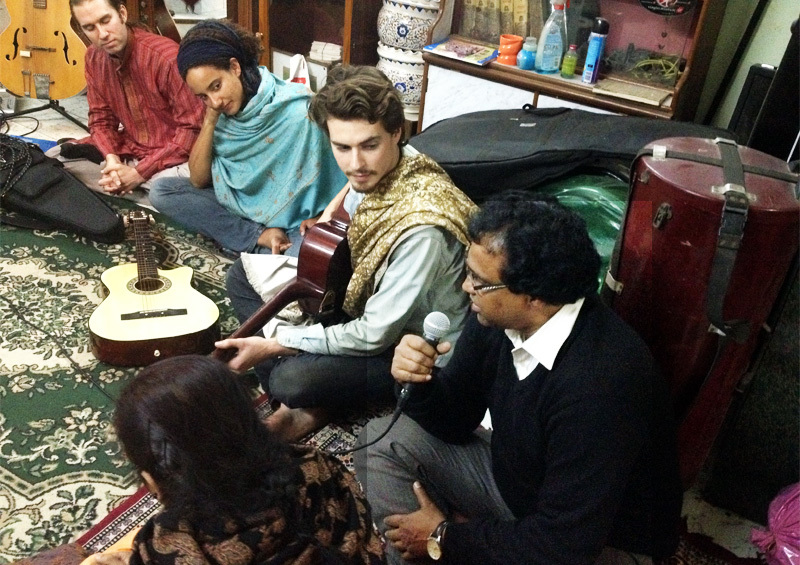 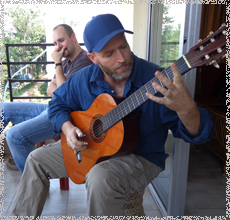 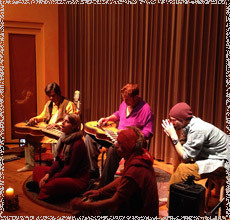 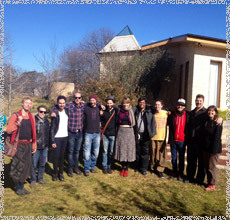 This is an exclusive event for the Bhattacharya’s school of universal music winter semester…. 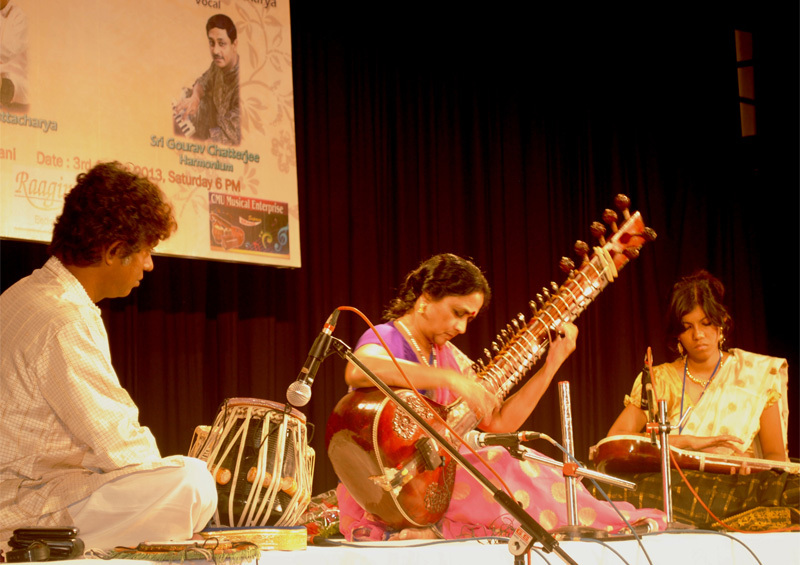 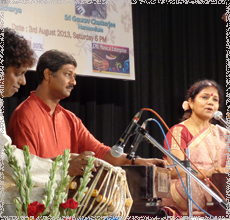 Vidushi Manju Mehta performing at the BSUM Annual Concert. 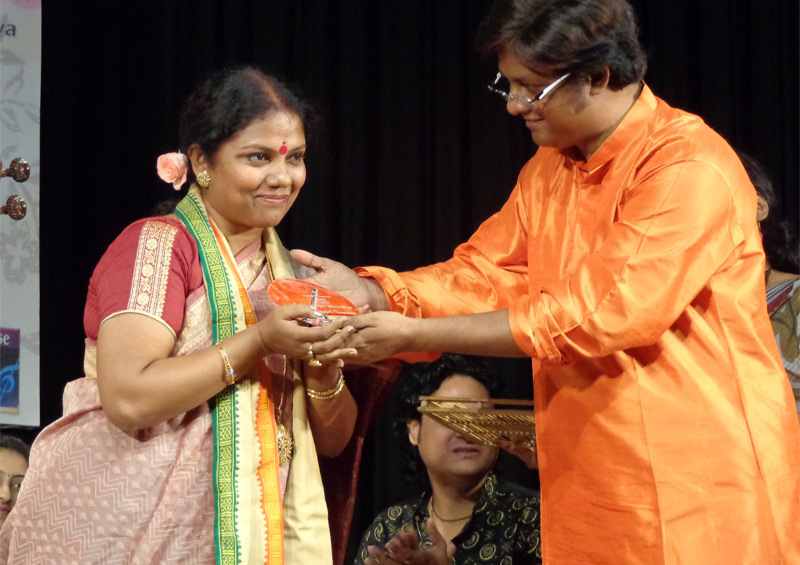 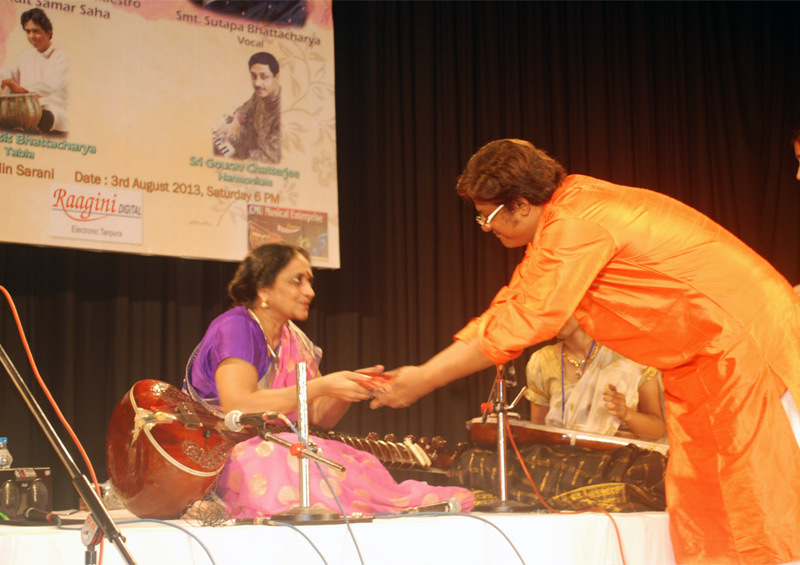 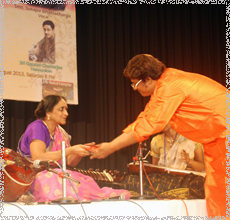 Smt Sutapa Bhattacharya at the Kolkata Siblings concert at G.D. Birla. 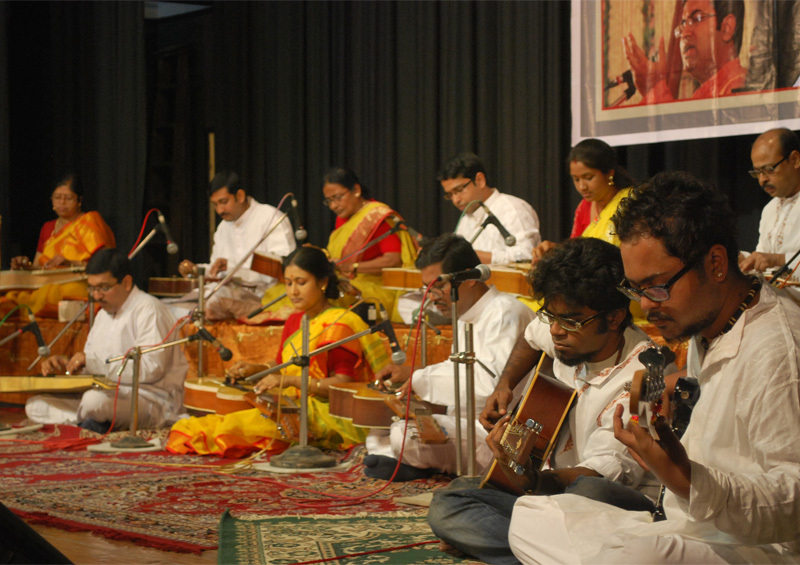 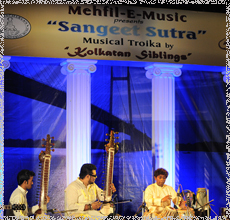 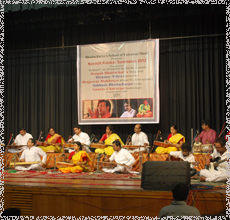 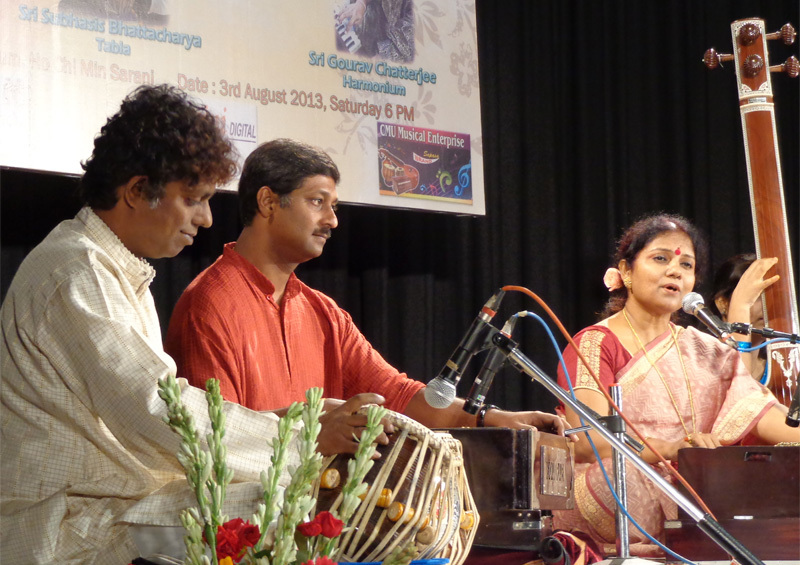 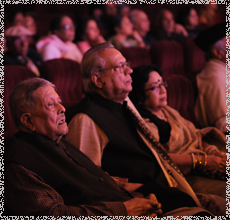 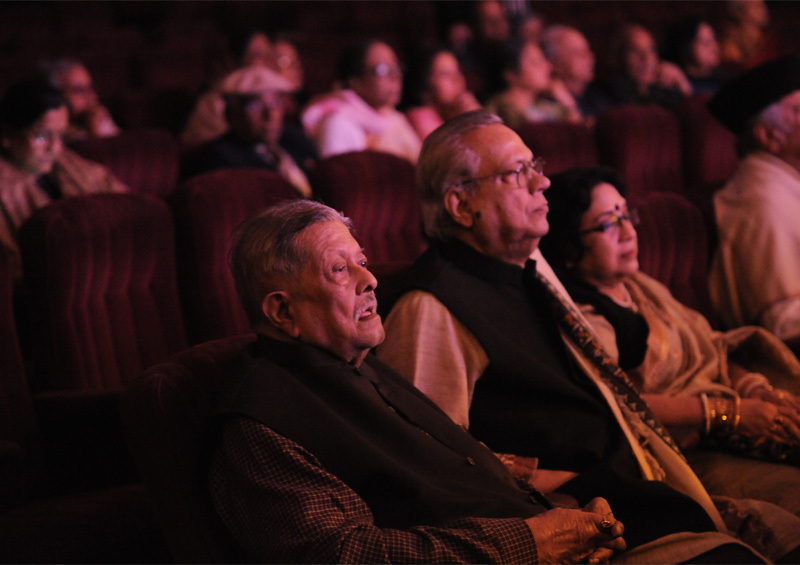 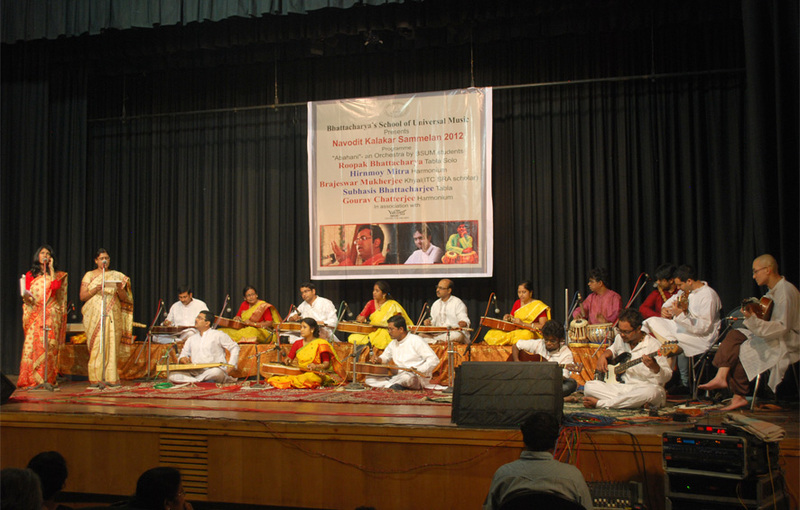 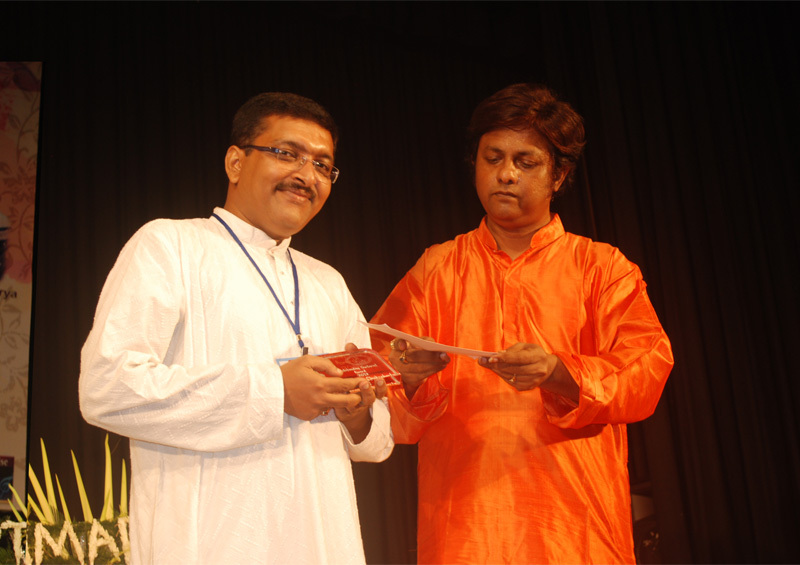 Felicitaion of Pandit Samar Saha at the Kolkata Siblings concert. 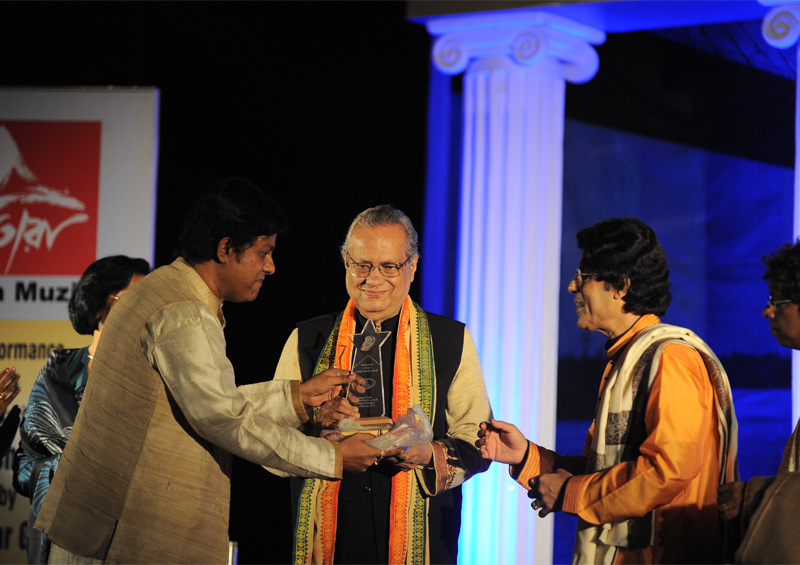 BSUM presenting young outstanding Guitarist award to Somranjan Chakraborty. 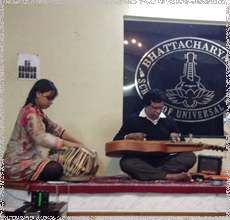 National Brother’s Concert organized by BSUM. 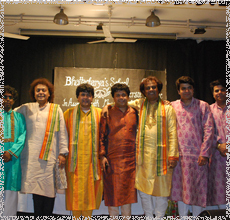 The National Brothers concert, bringing together artistes from all over India. 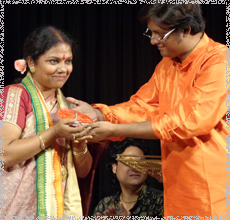 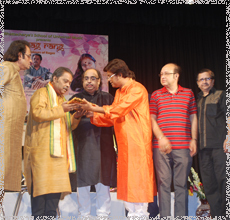 Pandit Debashish Bhattacharya honoring Pt. 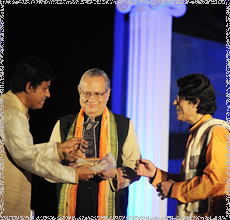 Ajoy Chakraborty by presenting self-designed tanpuras. 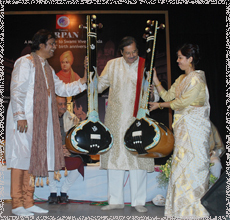 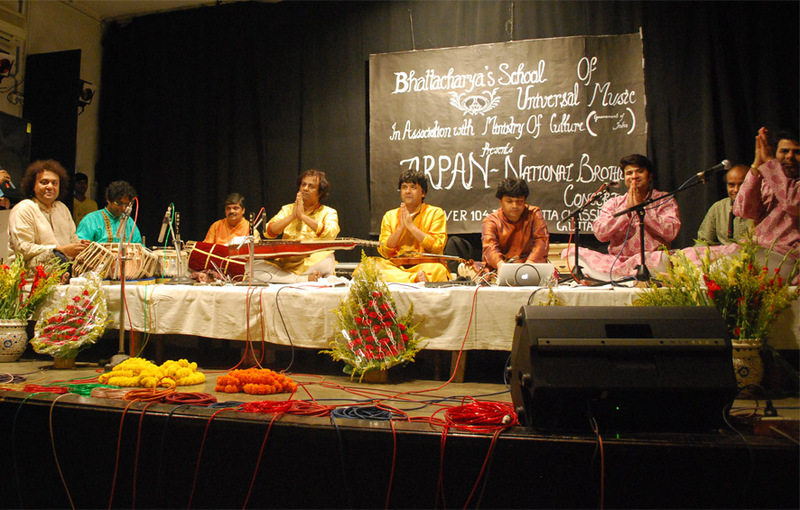 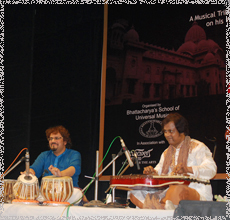 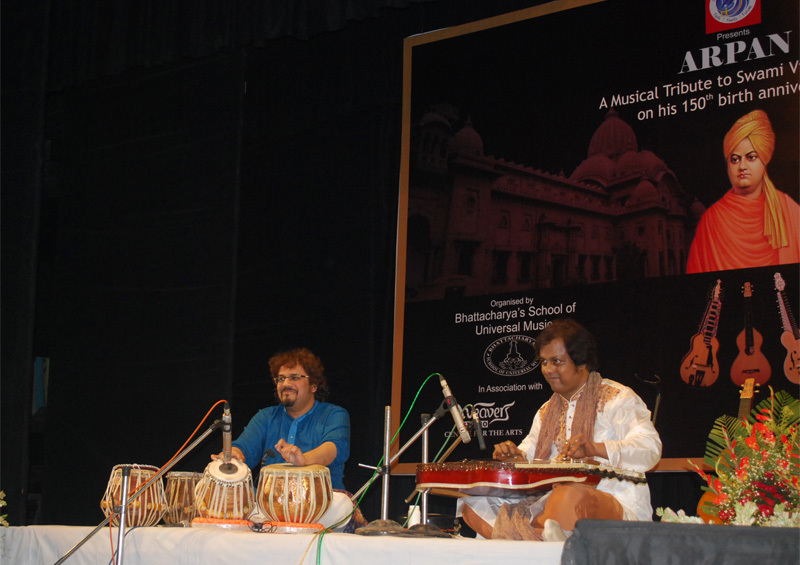 Pandit Debashish Bhattacharya and Pandit Bickram Ghosh enthrall the audience at ARPAN- organized by BSUM. 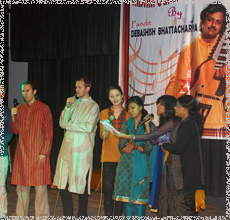 BSUM annual concert Nabvodit Kalakar Sammelan concert of the students of BSUM. 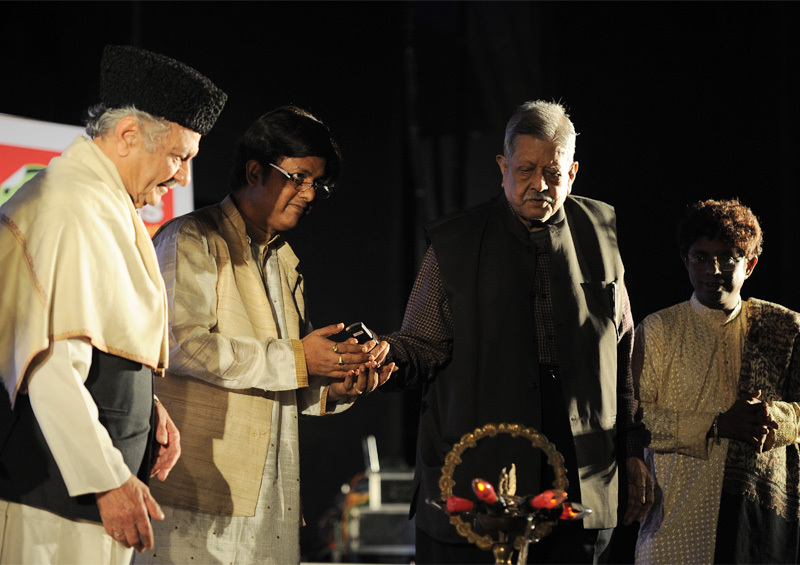 Lighting of the ceremonial lamp by Pandit Vijay Kichlu and Pandit Budhhadev Dasgupta. 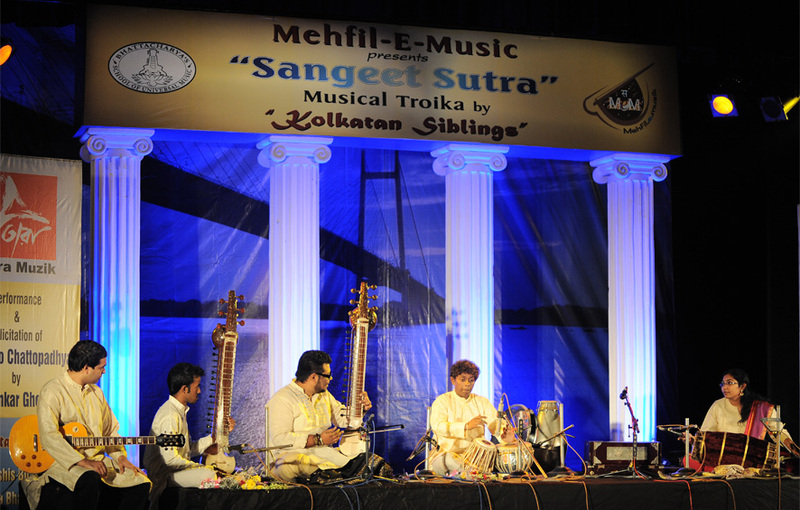 Subhasis Bhattacharya performing in the Sangeet Sutra concert. 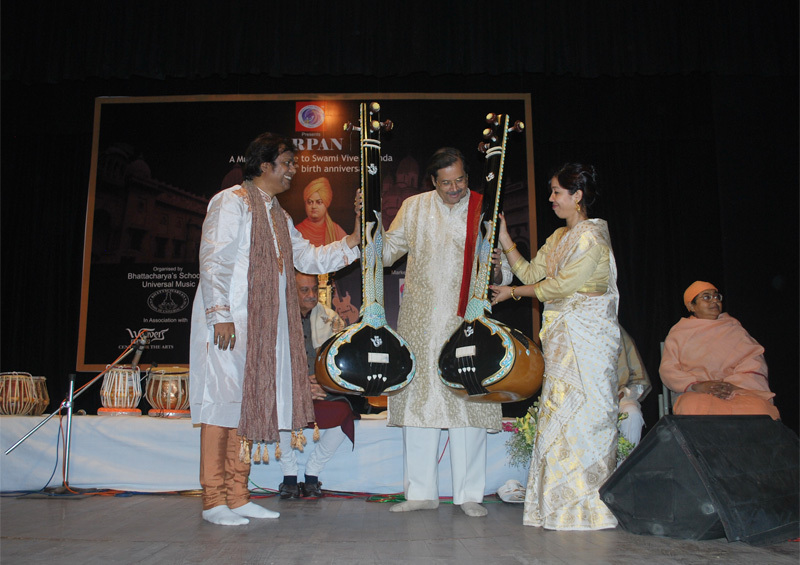 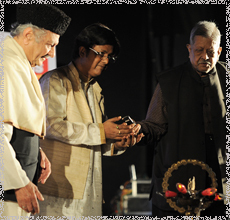 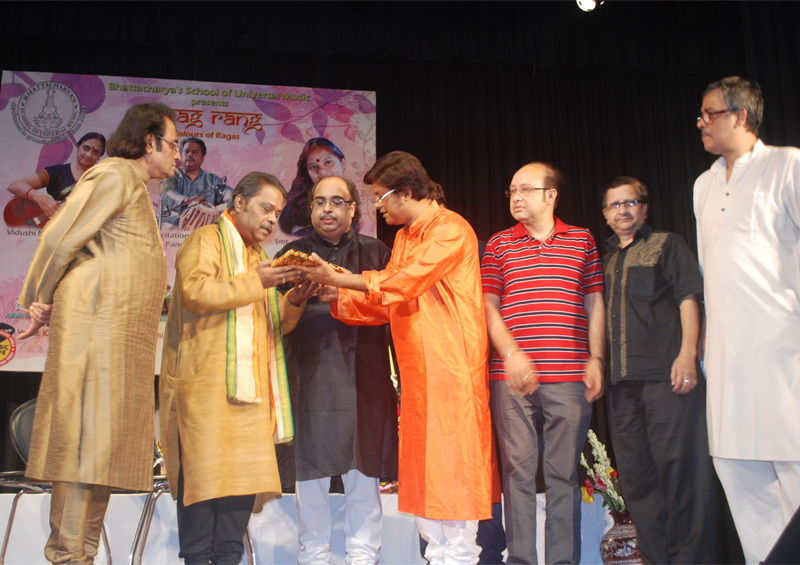 Pandit Debashish Bhattacharya and Pandit Anindo Chatterjee Felicitating Pandit. 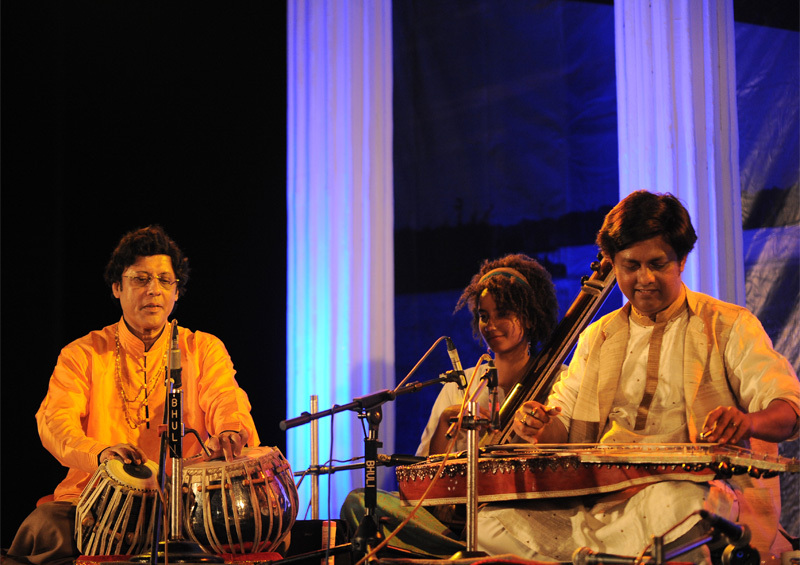 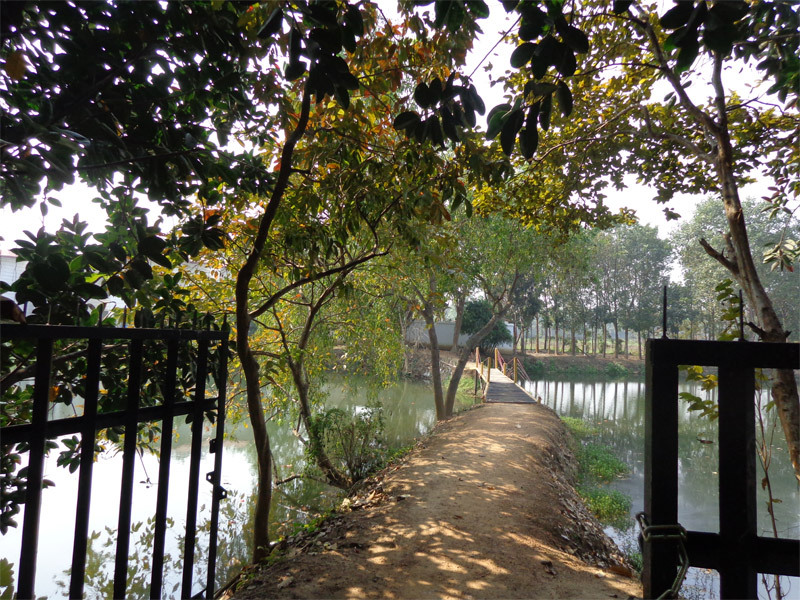 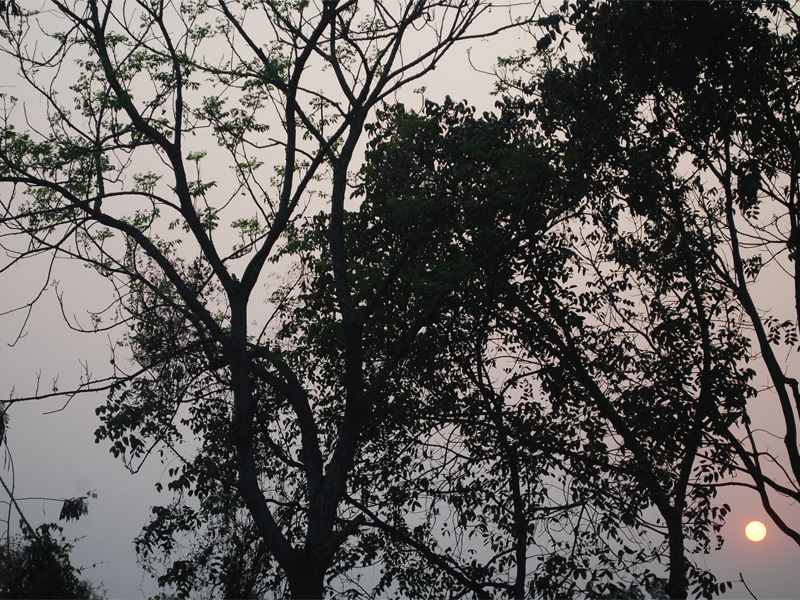 Shankar Ghosh. 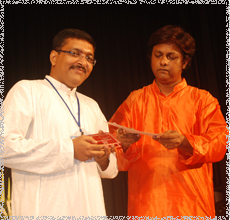 BSUM Award went to Sri Tapas Das physicist for amazing result of yoga and Natturopathy. 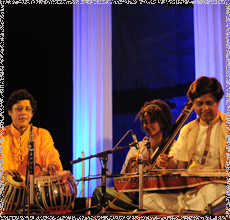 Pandit Buddhadev Dasgupta, Pandit Shankar Ghosh and Smt. 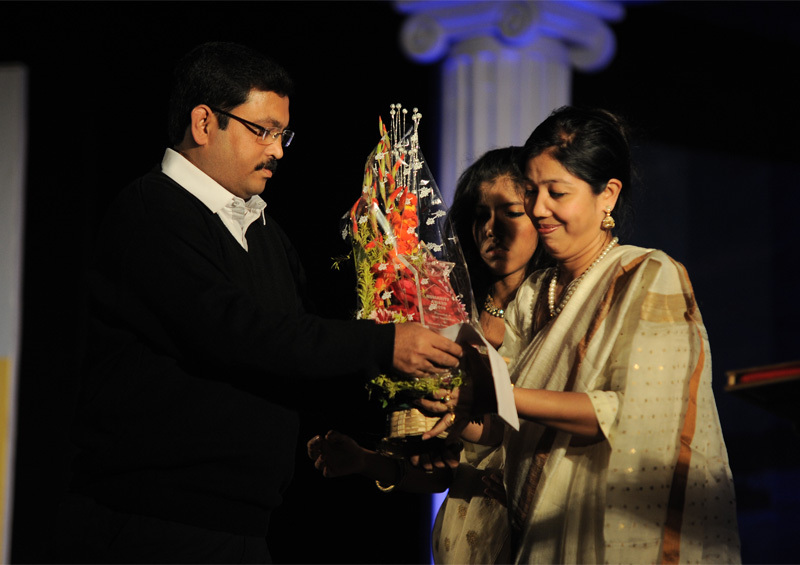 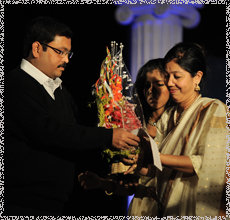 Sanjukta Ghosh as audience inspiring the event, with their gracious presence.